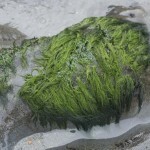 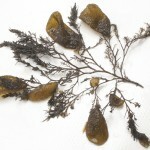 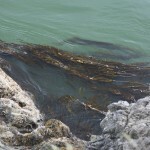 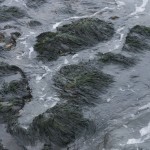 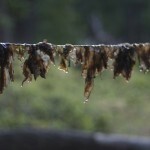 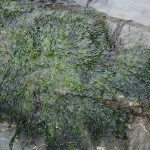 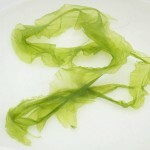 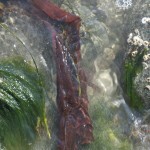 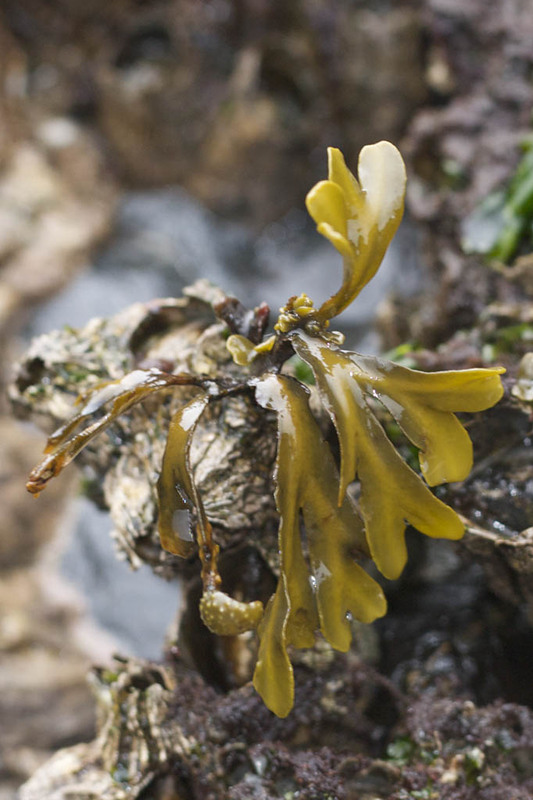 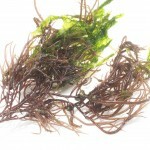 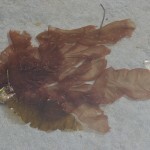 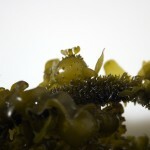 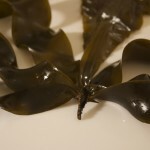 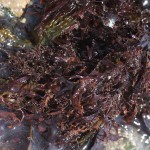 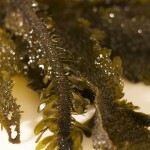 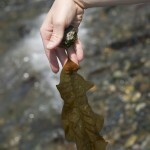 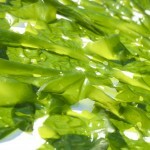 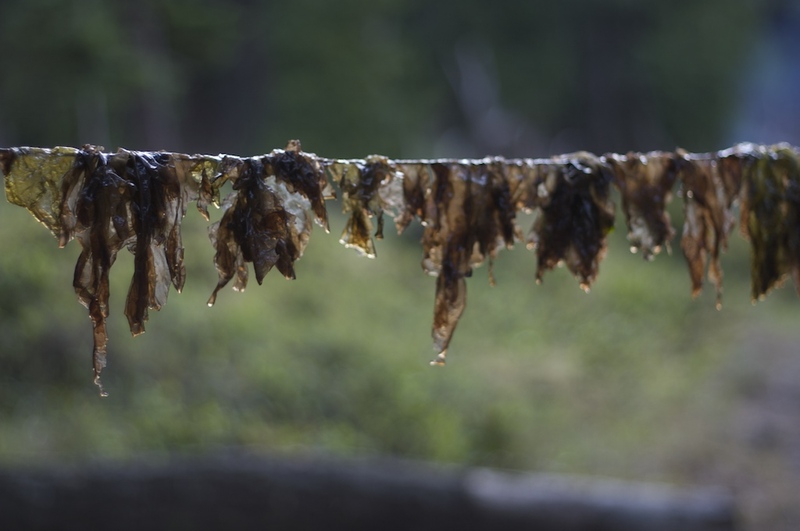 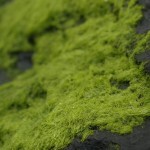 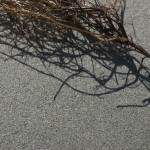 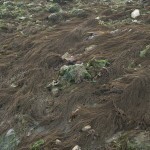 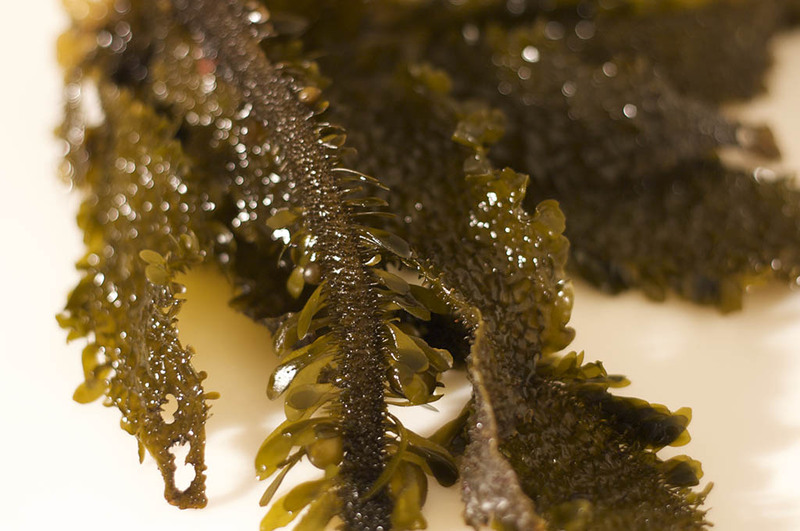 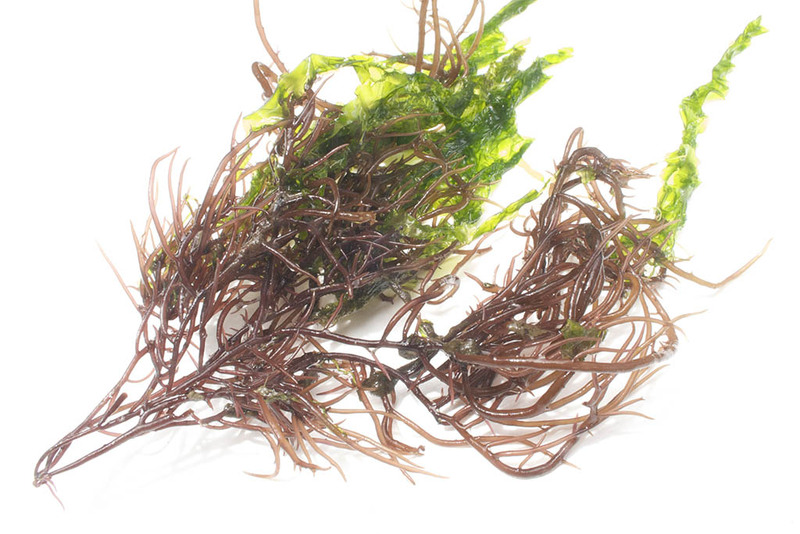 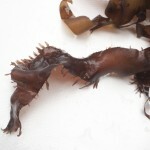 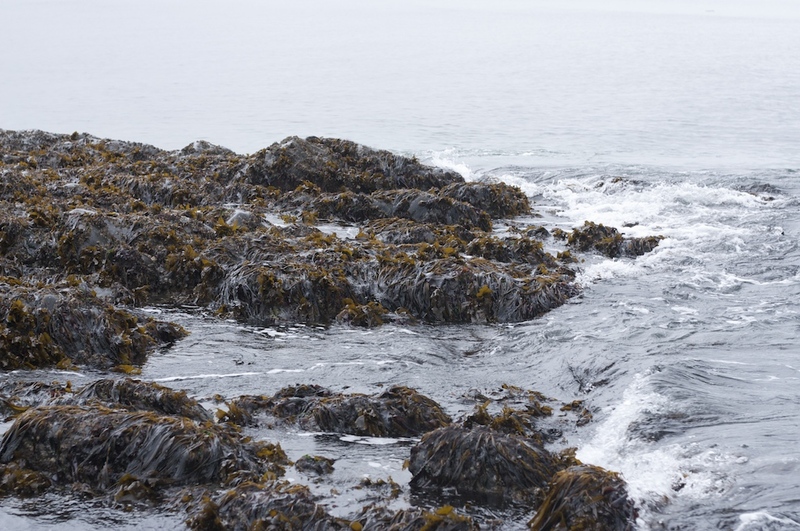 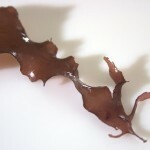 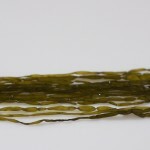 Description: This seaweed grows attached to rocks or other seaweed and drapes down like ropes. 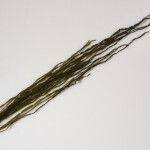 The ropes are made up of tangled filaments and look like dread-locks. 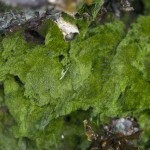 Similar species: There are many similar species that are only distinguishable with a microscope, including Acrosiphonia coalita and Acrosiphonia spinescens. 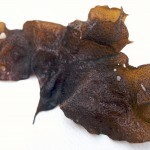 Description: Broad blade, irregular edges. 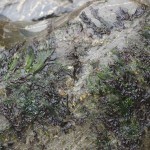 Small discoid holdfast, one or more blades per hold fast. 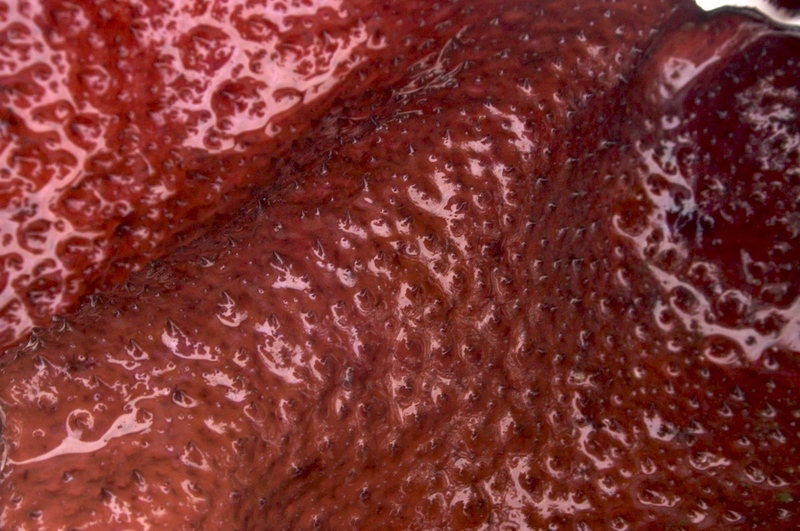 Covered with small bumps (papillae). 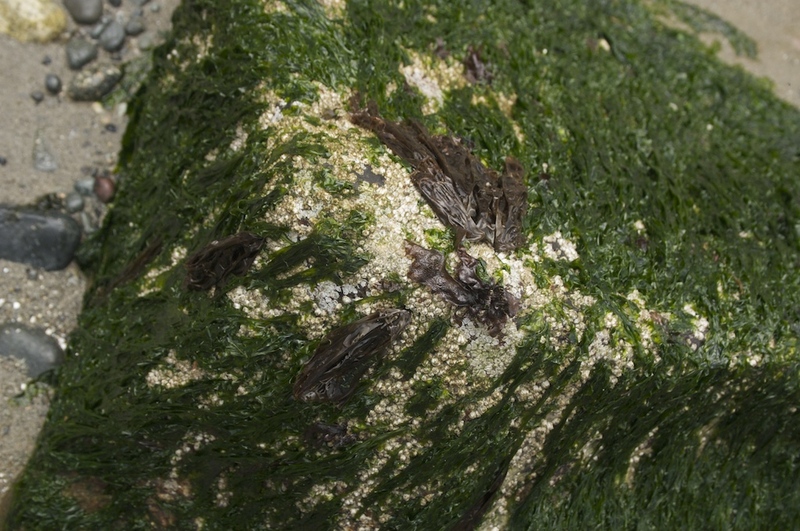 Description: Branching stipe connected to a small holdfast. 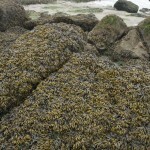 Bushy or shaggy-looking branches alternating with bumpy brown to olive balloon-like sacs of 1–2”. 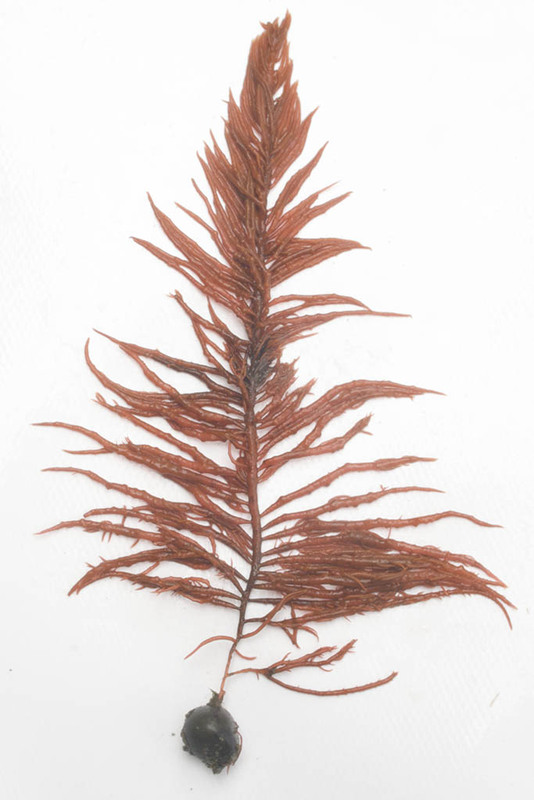 Distinctive characteristics: An epiphyte — grows on species of red algae. 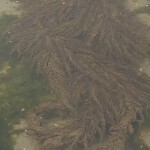 Description: Long narrow tubes, less than .5” in diameter, in clusters but not branched. 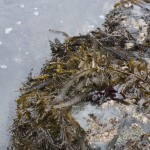 Small disc-like holdfast. 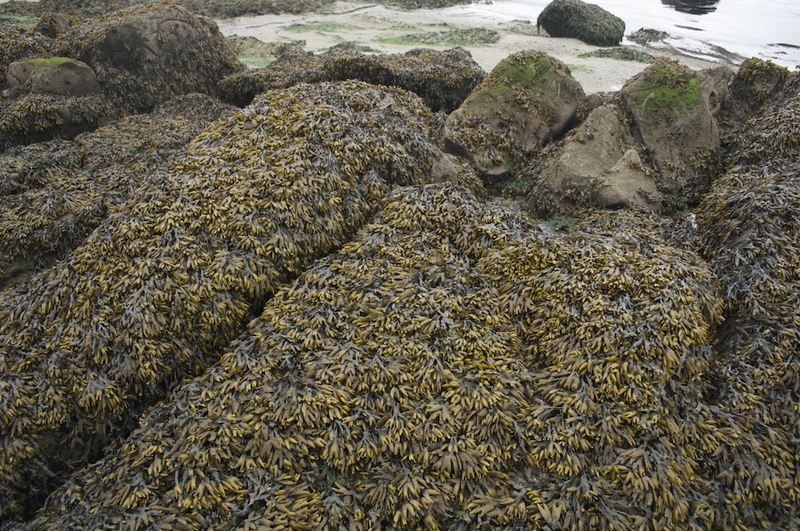 Simplicissimus is segmented, reminiscent of sausage links; other species of Scytosiphon are not. 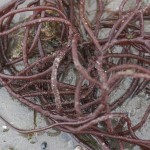 Similar species: Melanosiphon intestinalis and other Melanosiphon (Twisted Soda Straws). 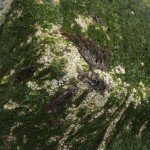 Can also be confused with Ralfsia in its crustose phase, when it looks like a brown coating on rocks. 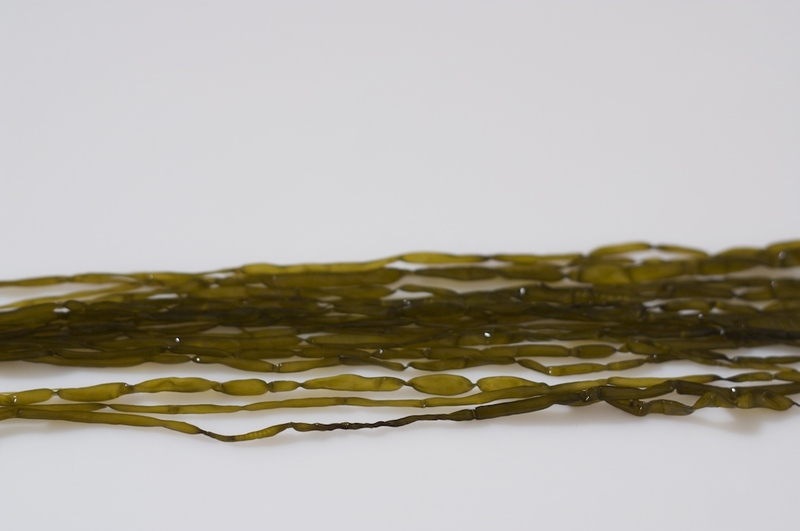 Description: A cascade of tiny blades with on a long, thin stipe with many branches, dotted with small, round, bead-like vesicles. 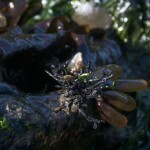 The stipe is attached to a small disc-like holdfast. 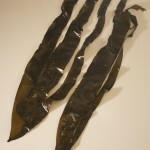 The blades are less that 1 inch with toothed edges. 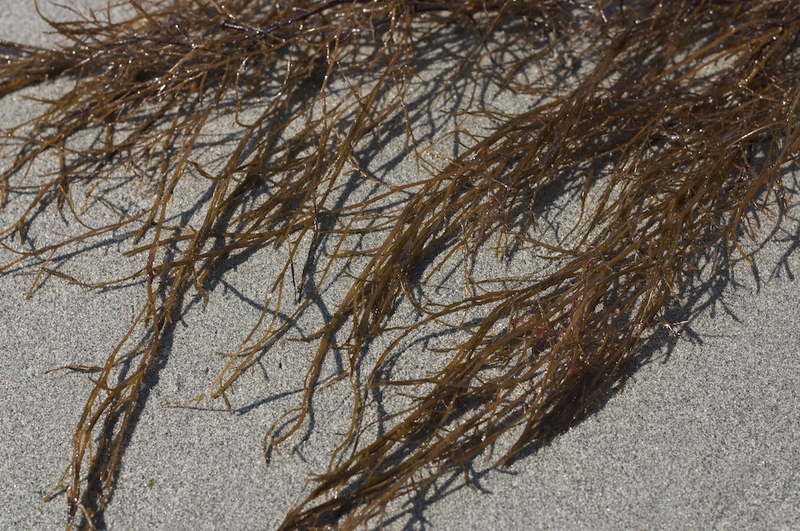 Sargassum sometimes forms floating masses and prefers wave-sheltered areas. 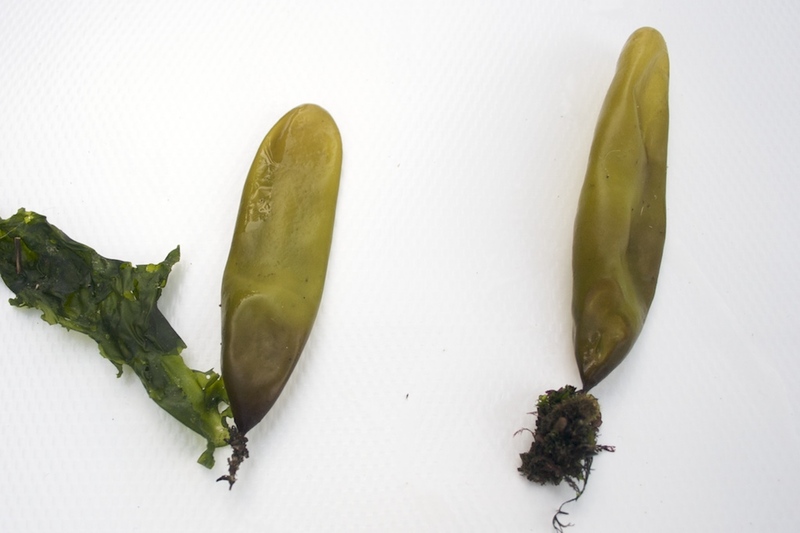 Distinctive characteristics: Aggressive invasive species. 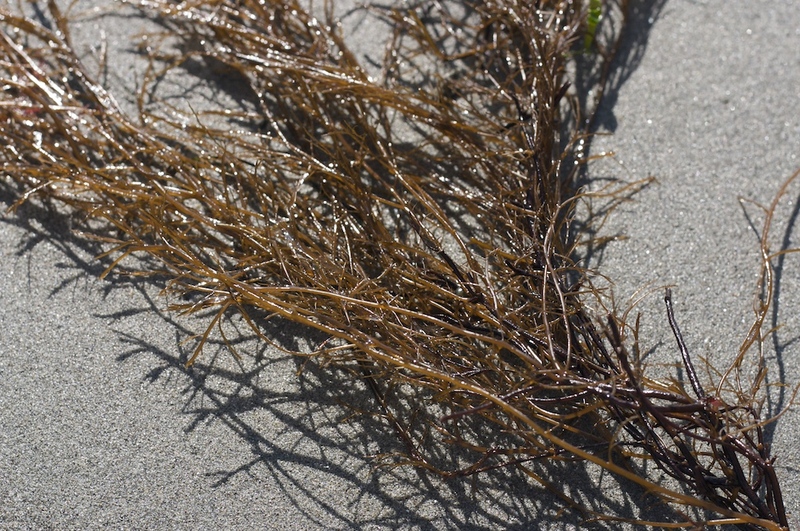 Similar species: Sargassum natans (of the Sargasso Sea), Cystoseira geminata, which has pointy floats, in addition to round ones. 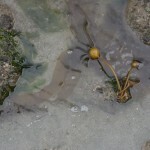 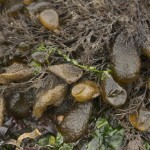 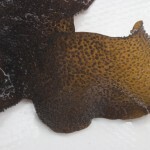 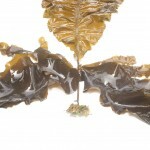 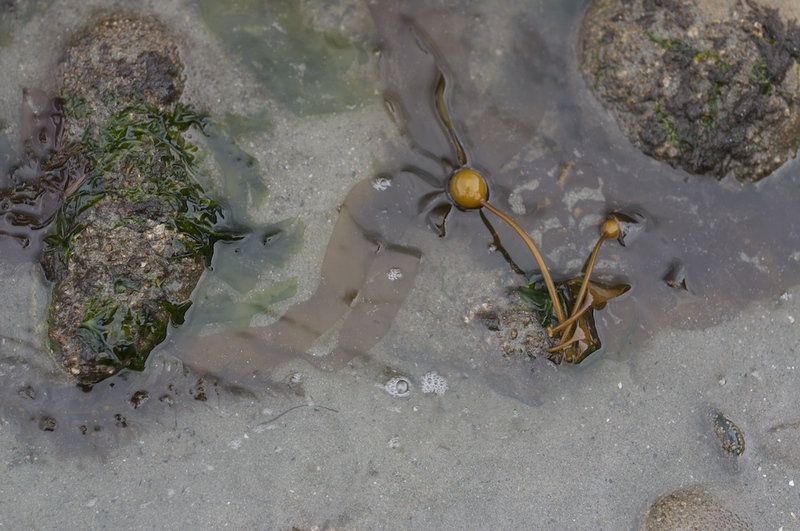 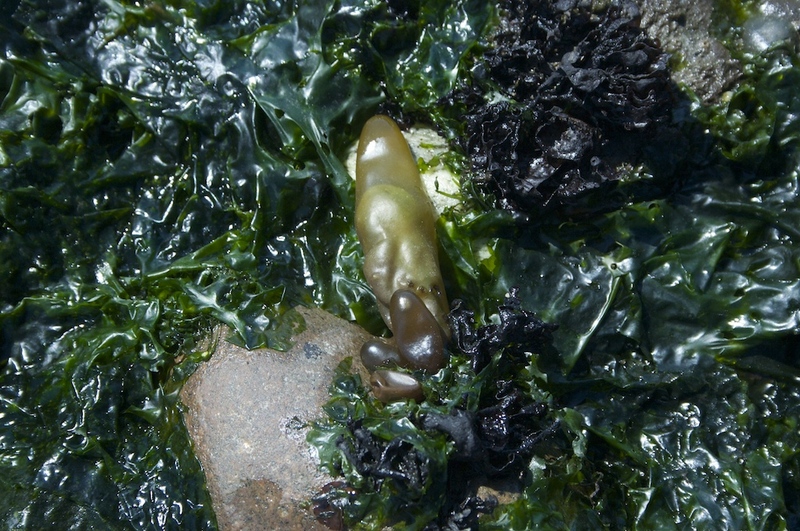 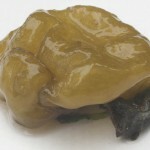 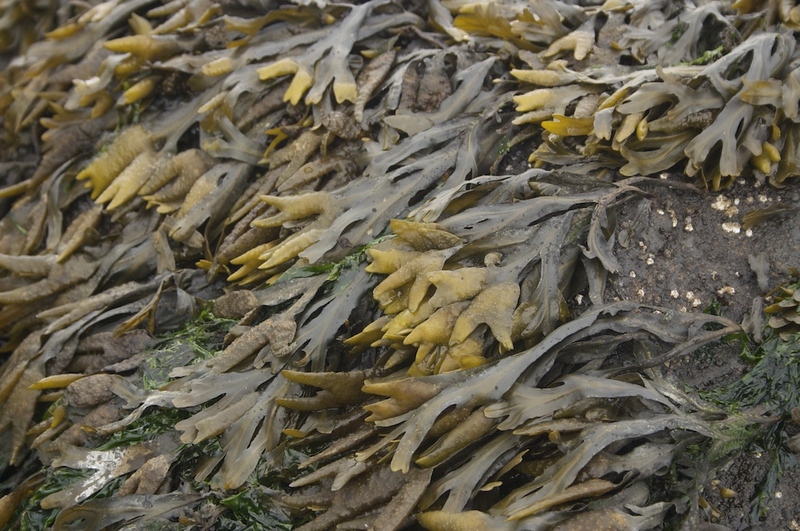 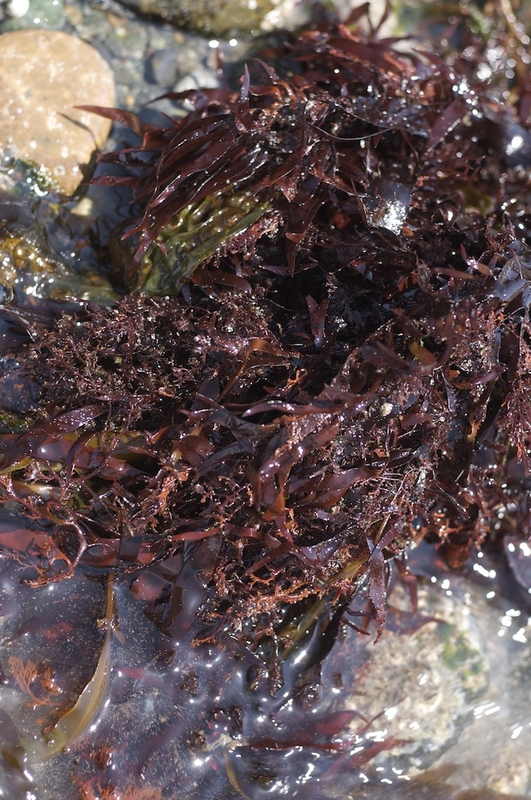 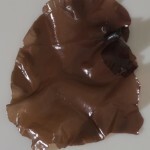 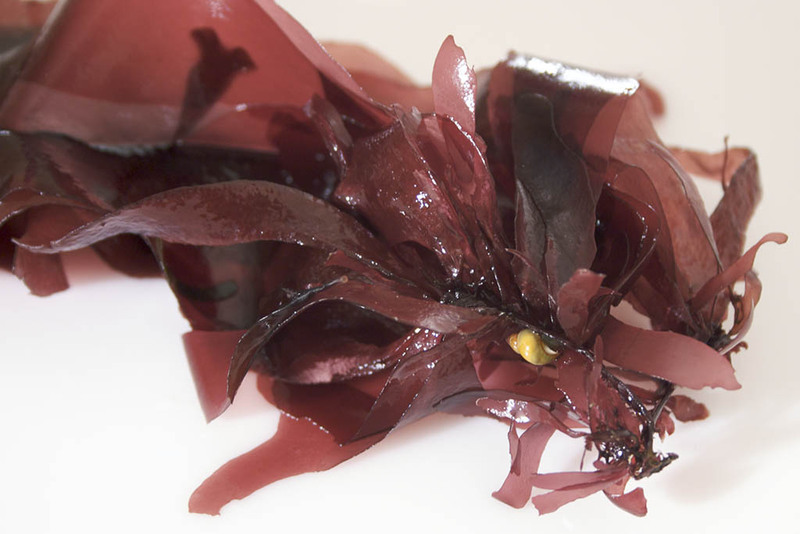 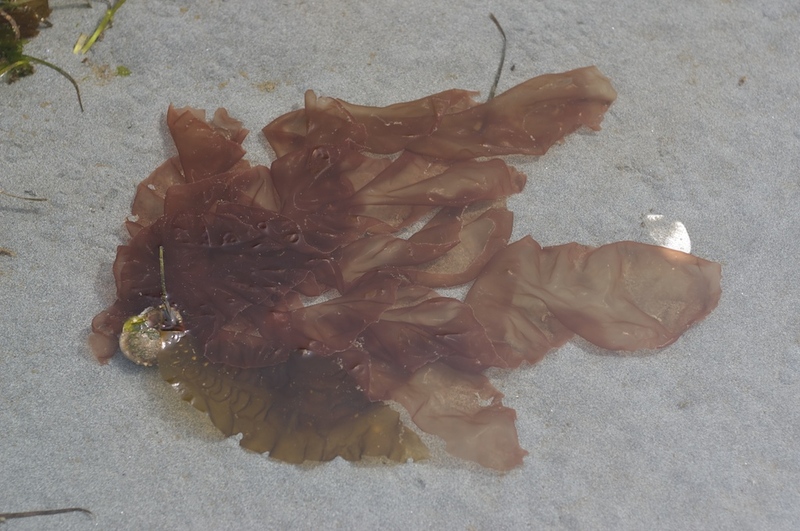 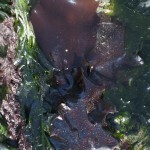 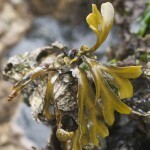 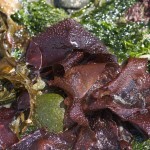 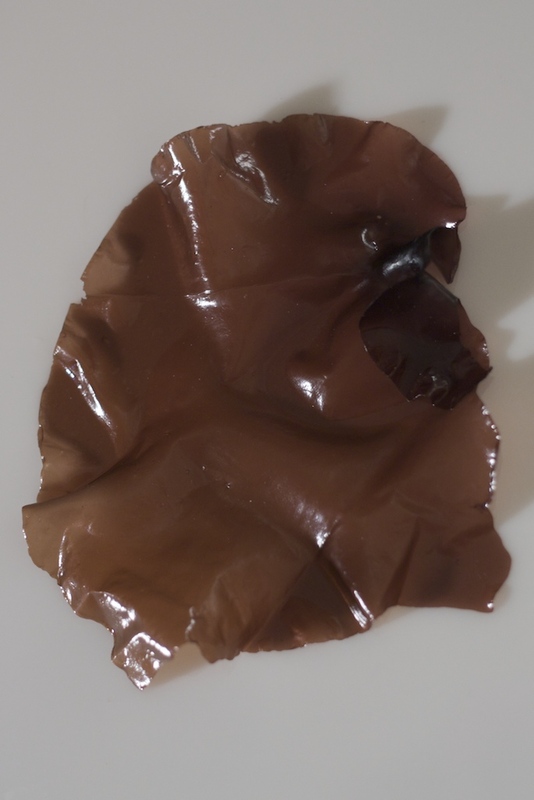 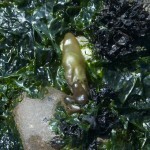 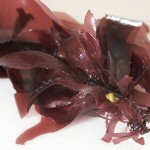 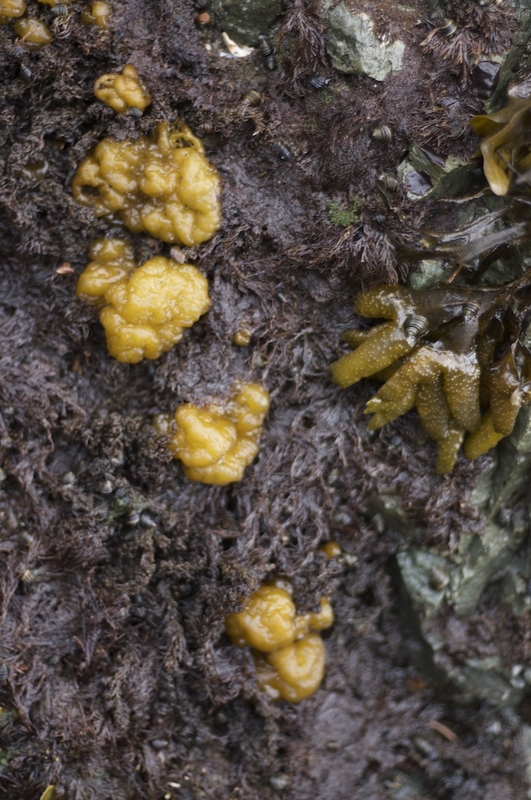 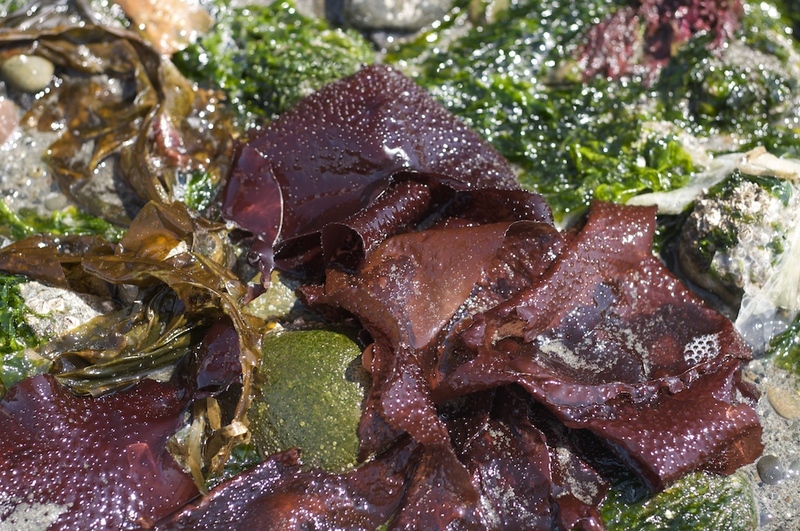 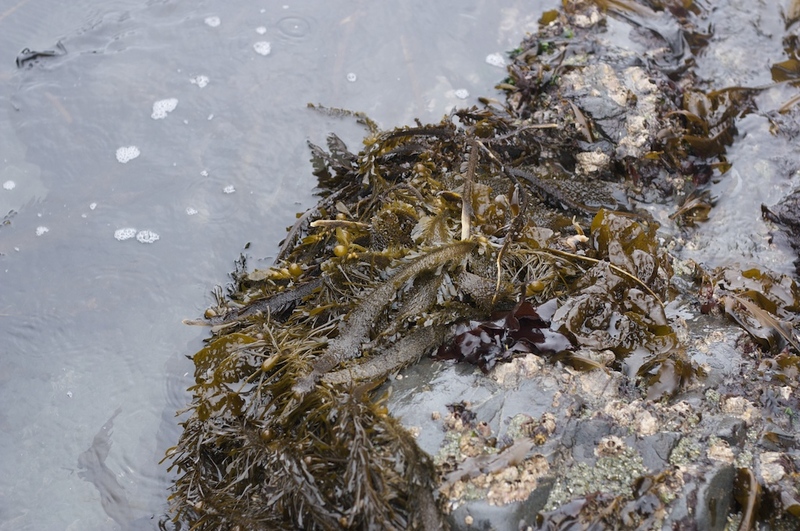 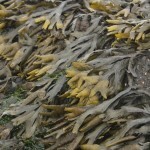 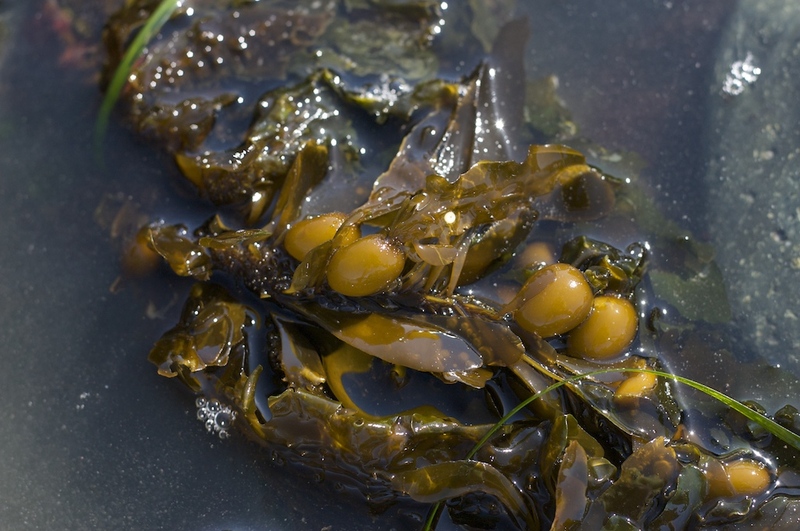 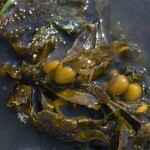 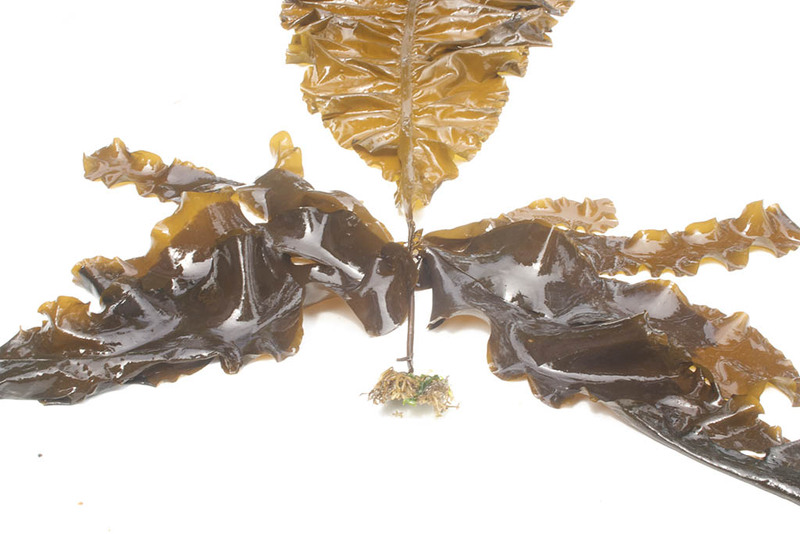 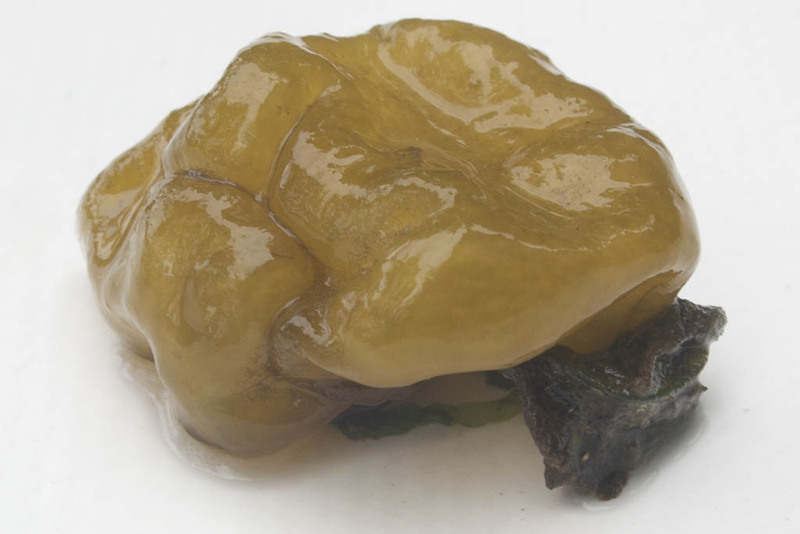 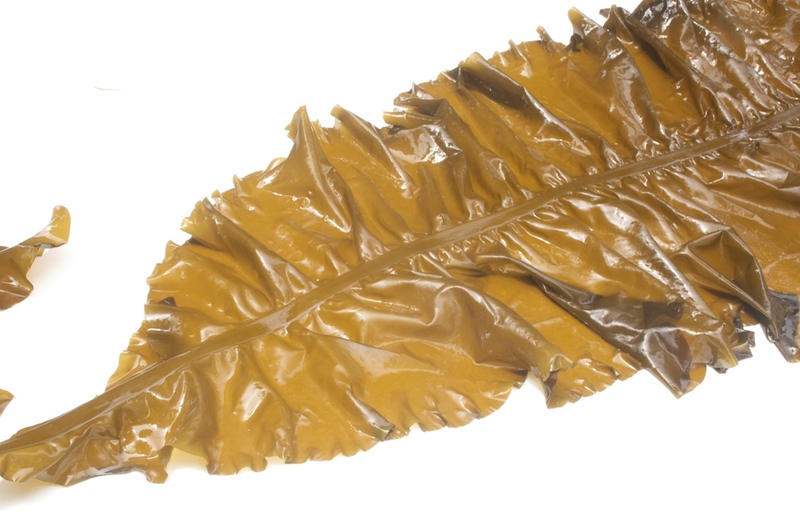 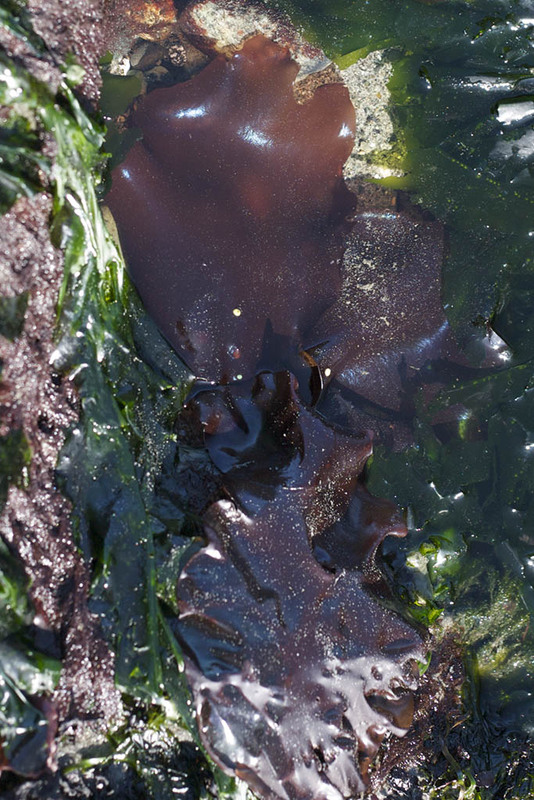 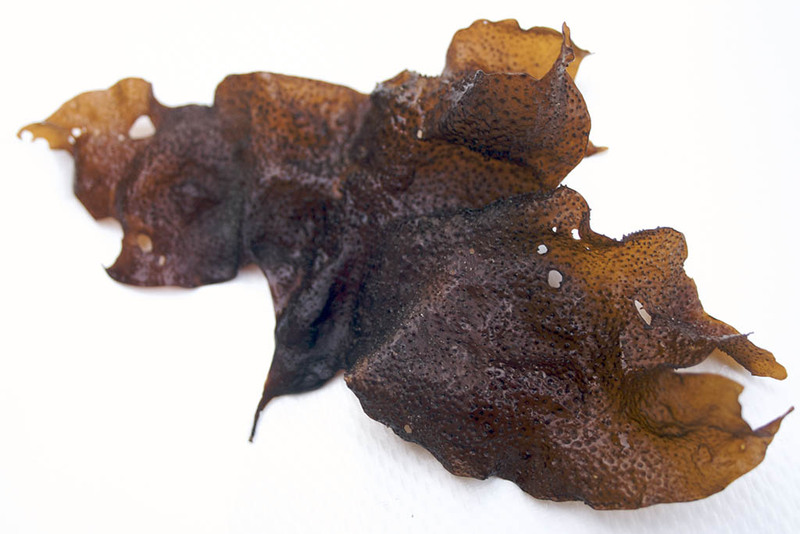 Description: This seaweed looks like small yellow-brown brains growing on the rocks or on other seaweeds. 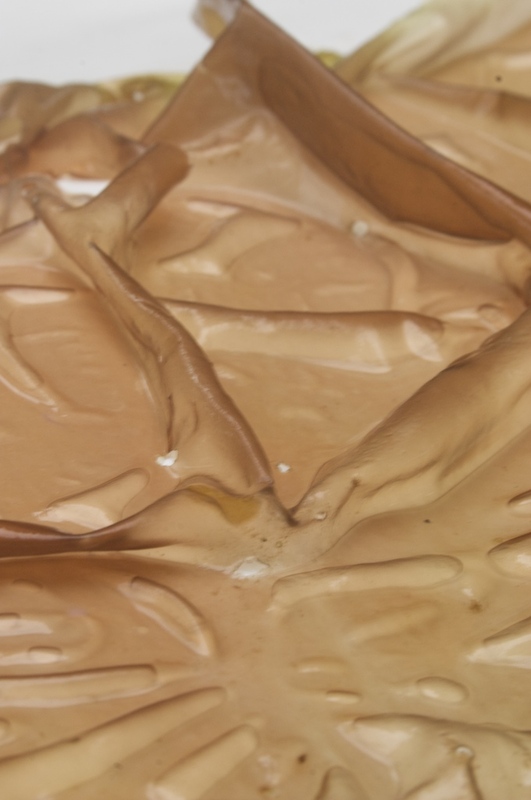 The interior is hollow. 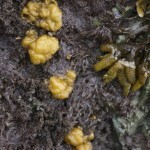 Sea Cauliflower tends to grow in clusters. 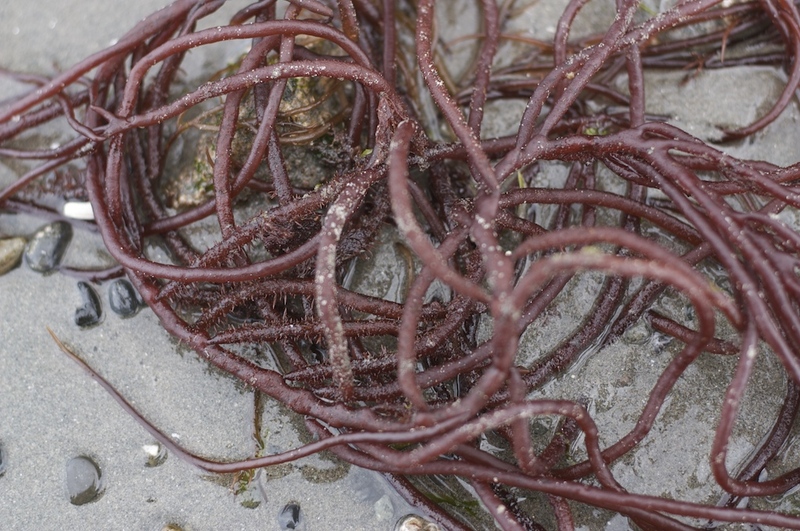 Distinctive characteristics: Disentegrates into filaments when squeezed. 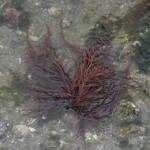 Similar species: Soranthera ulvoidea and Colpomenia bullosus when young. 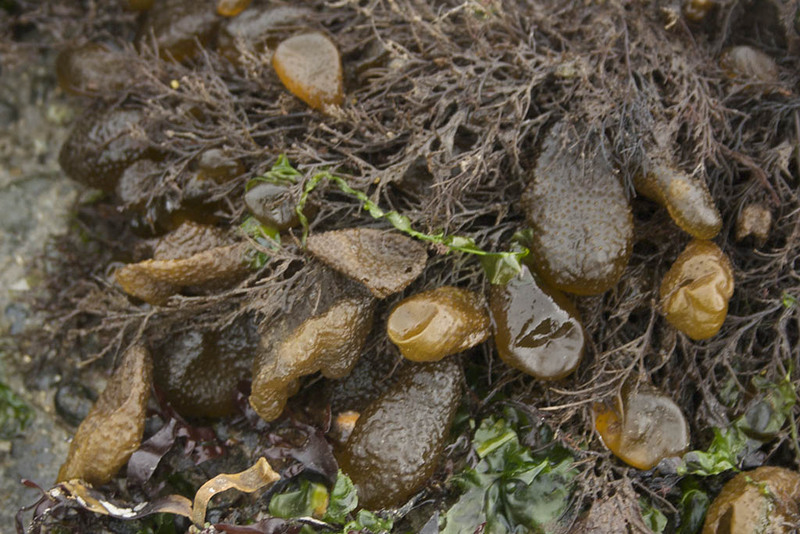 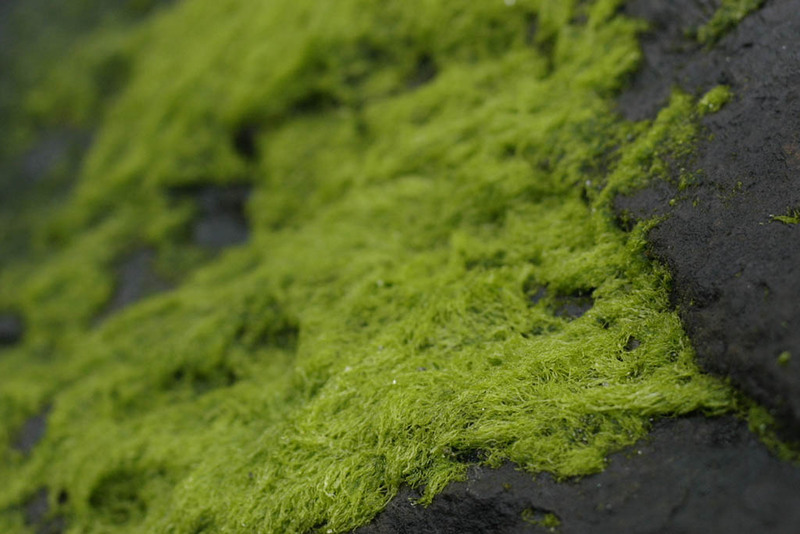 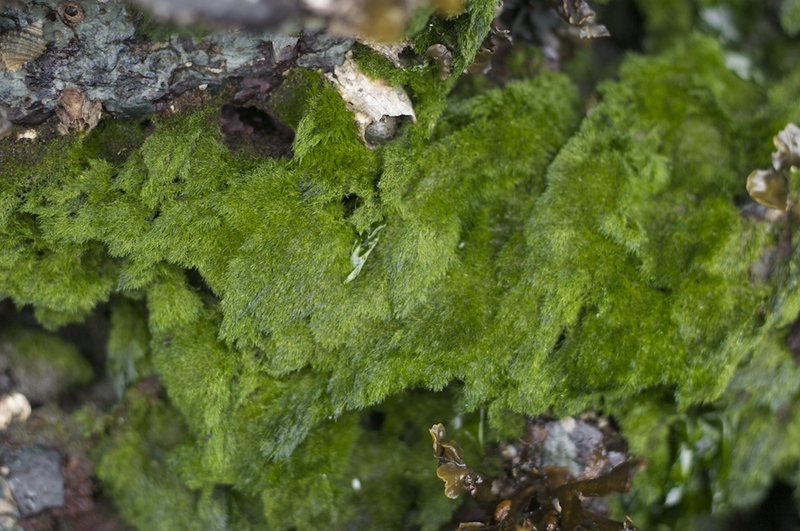 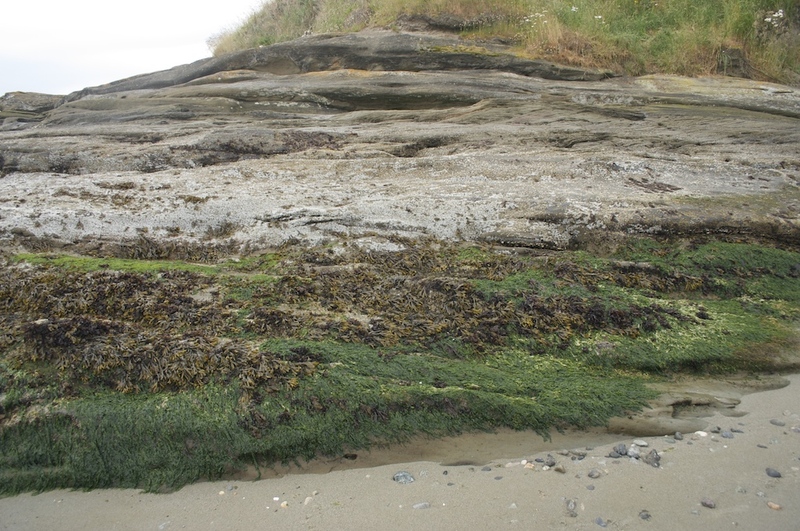 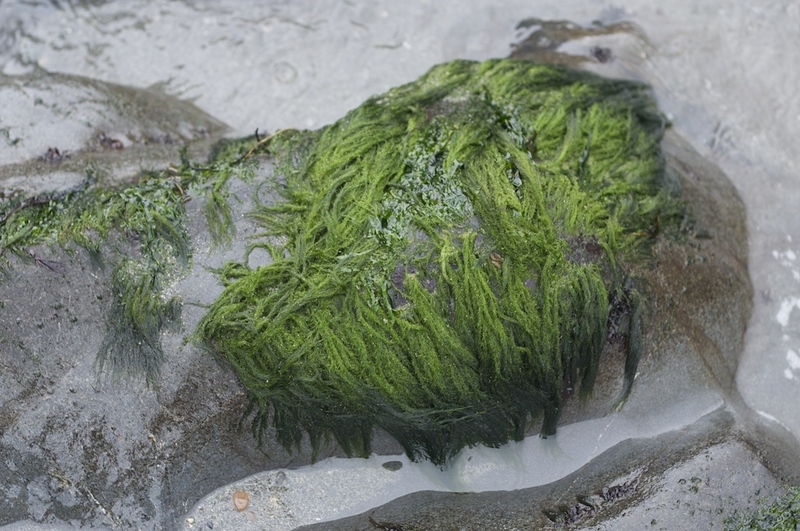 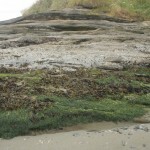 Description: This short furry-looking seaweed grows in clumps on rocks in the upper intertidal zone and looks similar to moss. 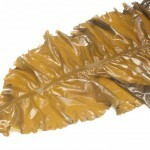 Description: Short, upright irregular blades that are rubbery and covered with small bumps. 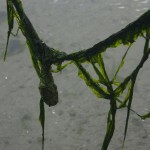 The ruffly blades taper to a small stipe and holdfast. 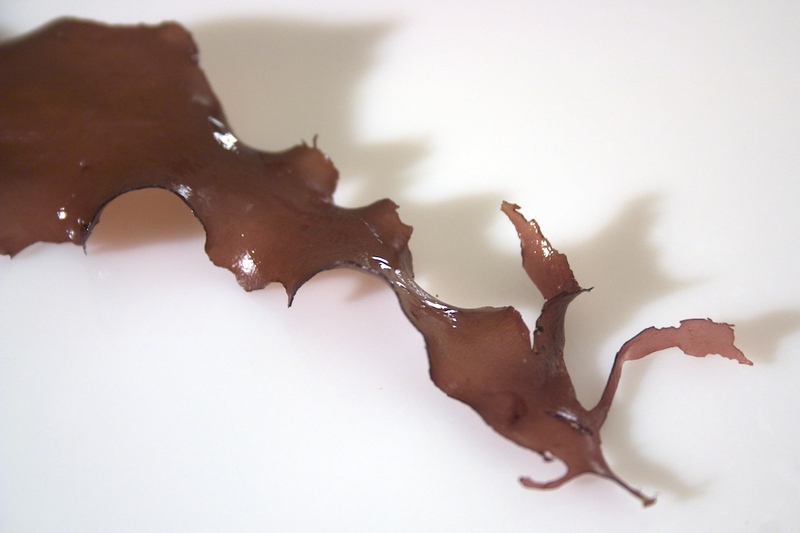 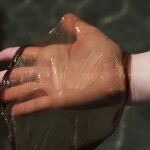 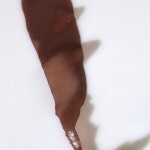 Edibility: Used to make carrageenan. 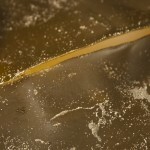 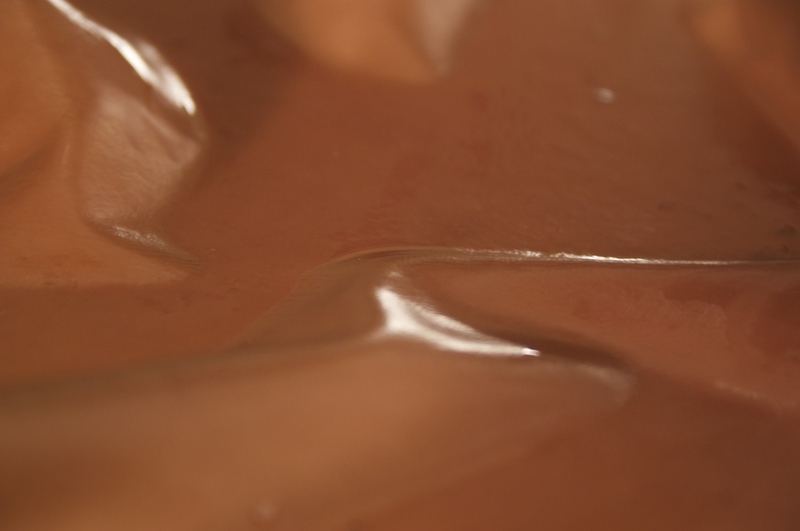 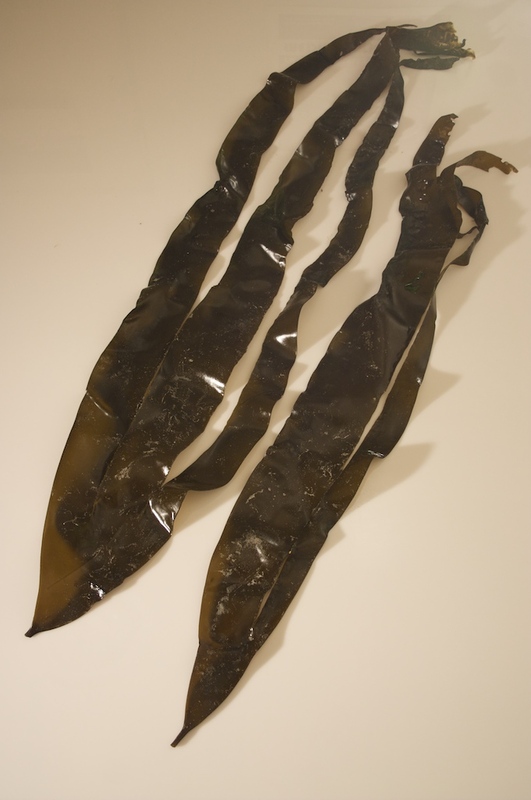 Can be boiled to make a gel-like thickener at home as well. 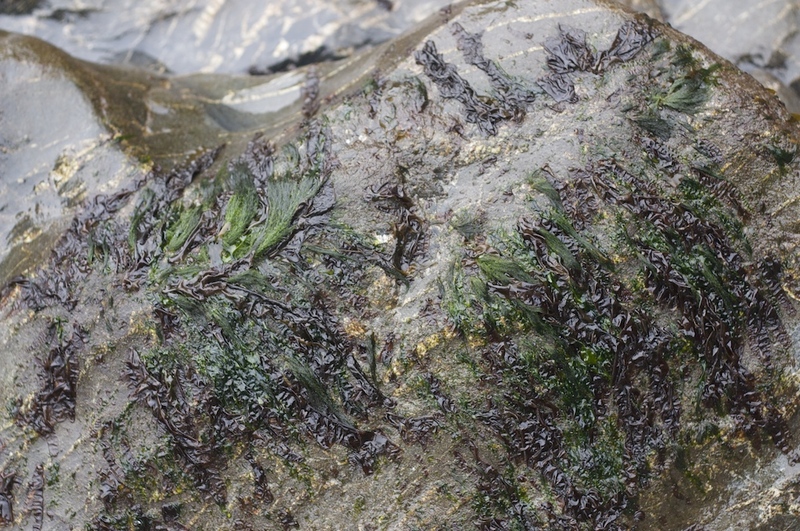 Distinctive characteristics: Forms a black tar-like “crust” on rocks during one phase of its lifecycle. 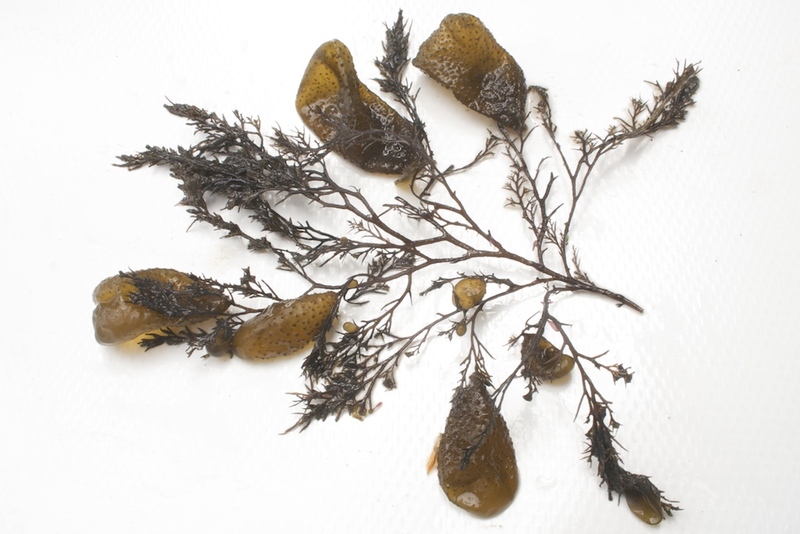 Description: This abundant seaweed is distinguished by the mitten-shaped hollow liquid or gas-filled pods at the ends of mature branches. 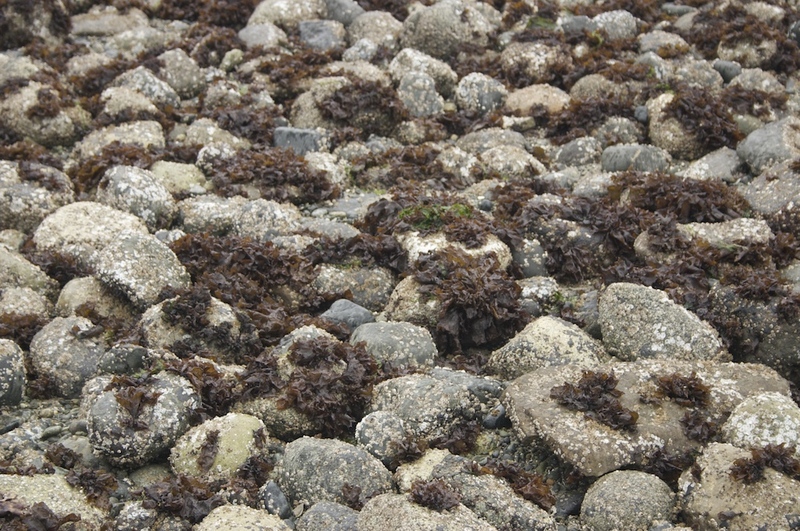 The pods have a bumpy exterior. 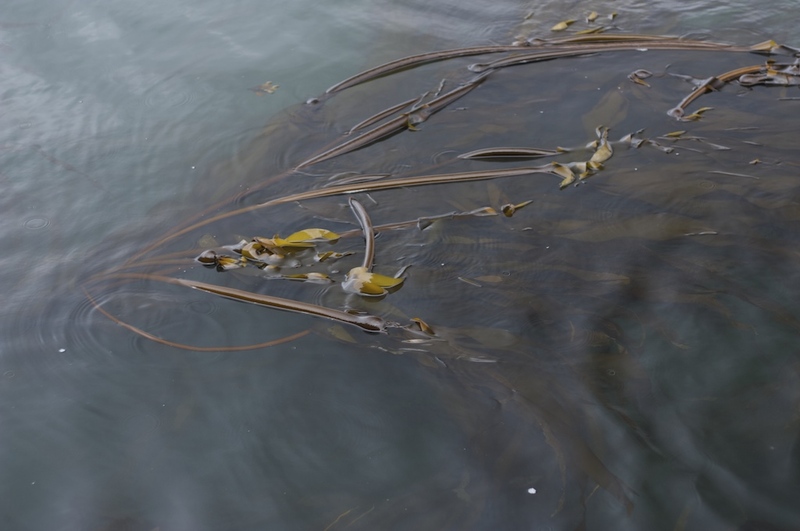 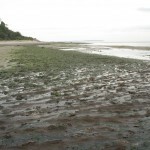 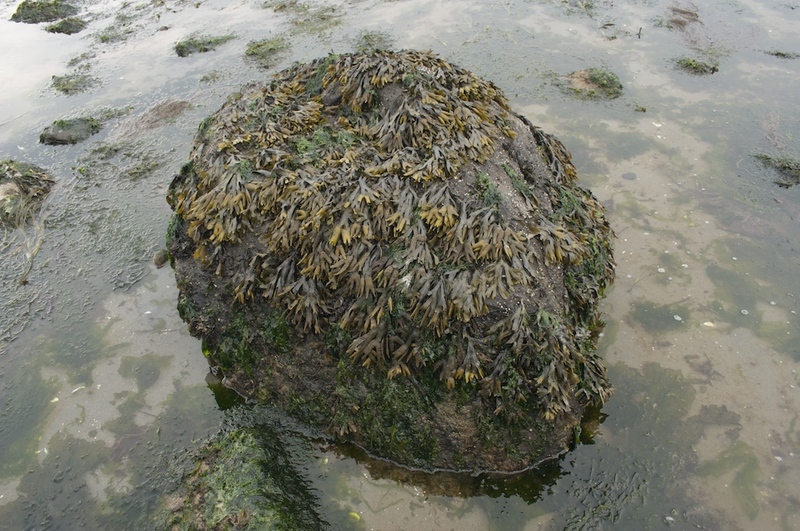 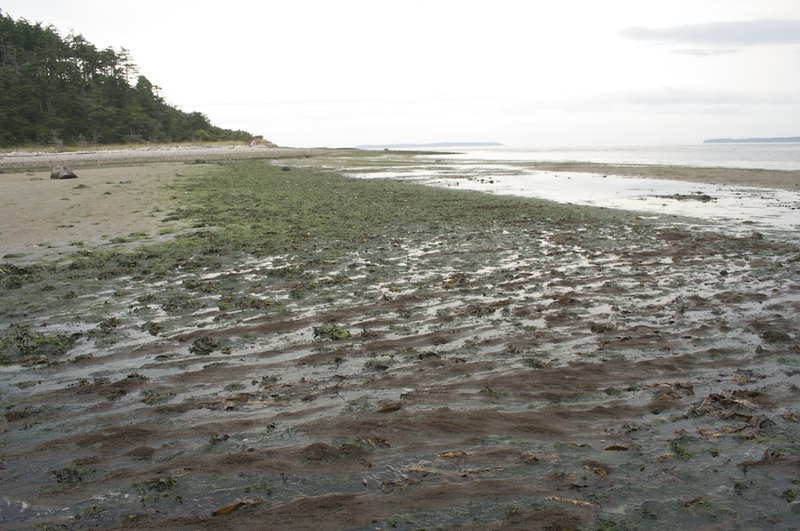 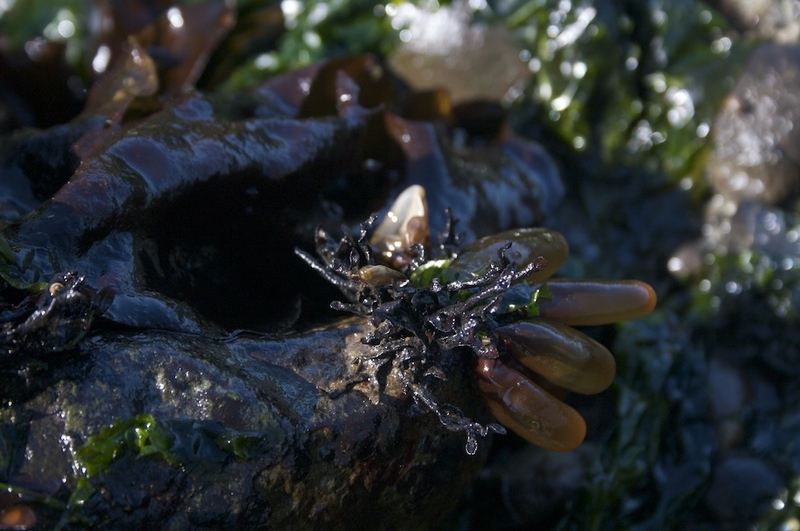 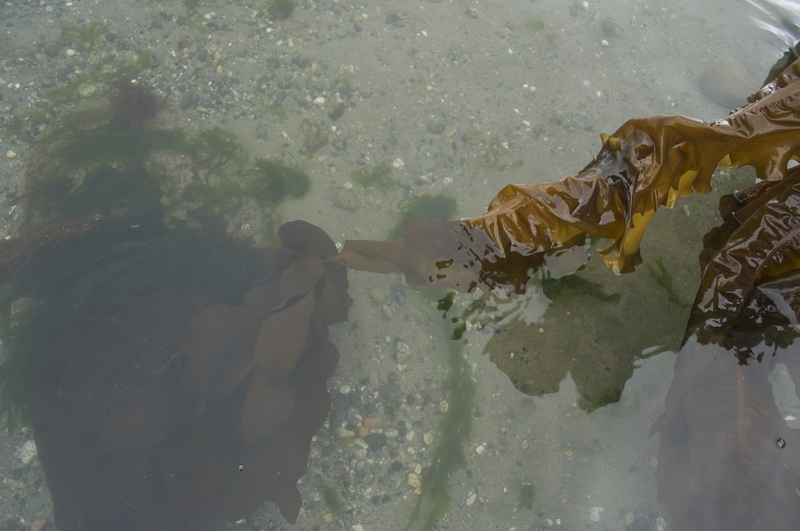 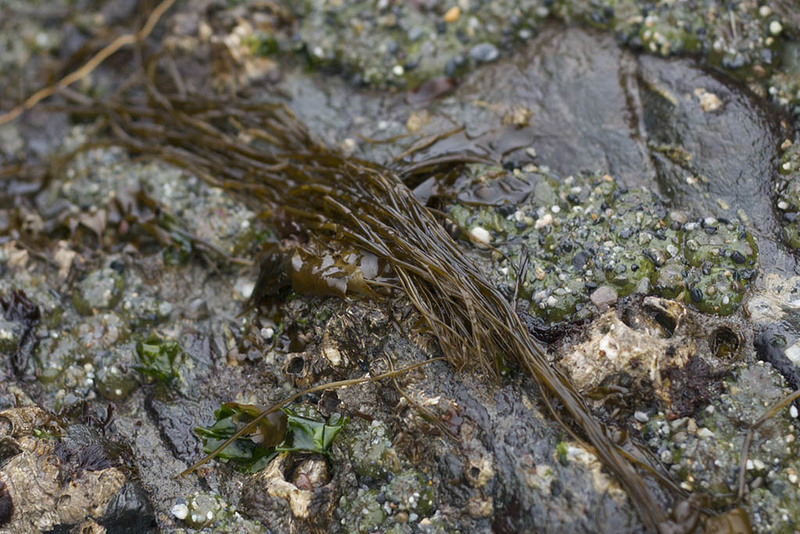 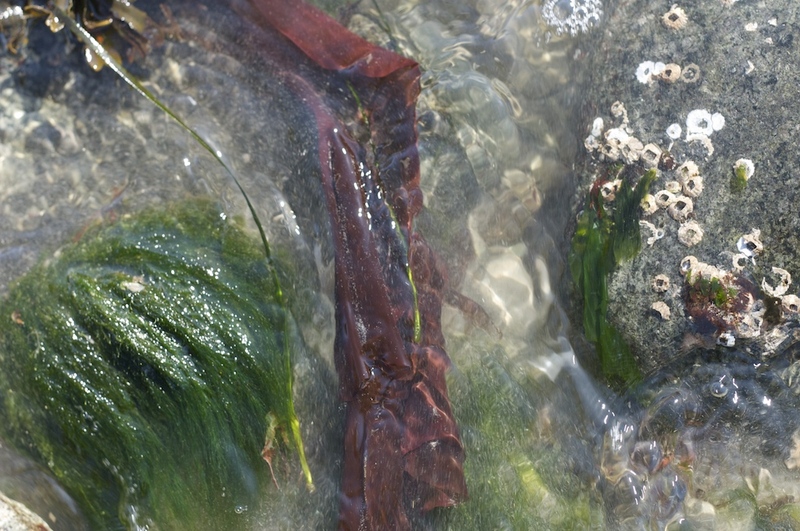 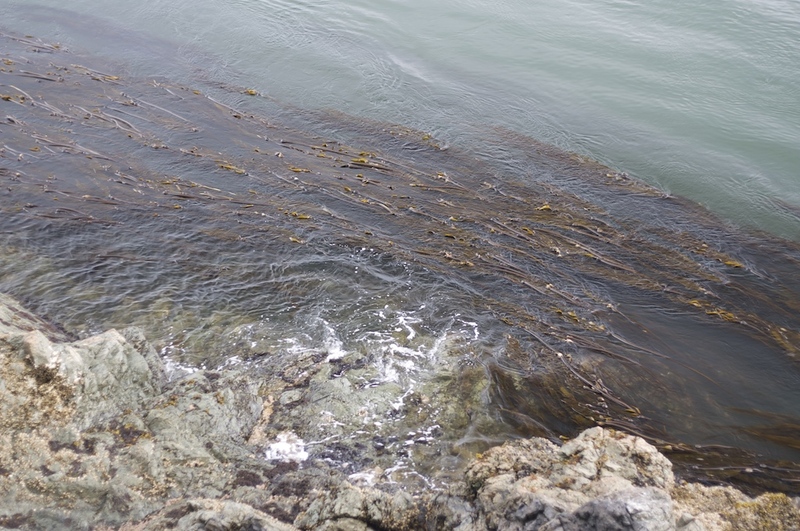 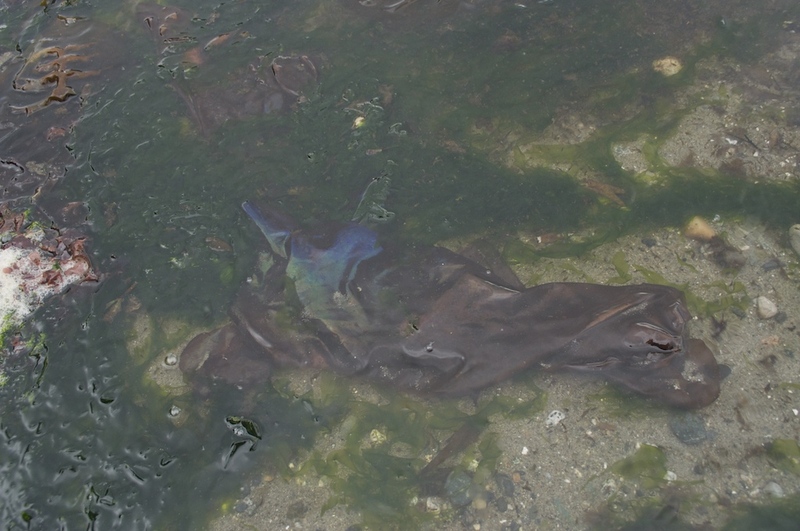 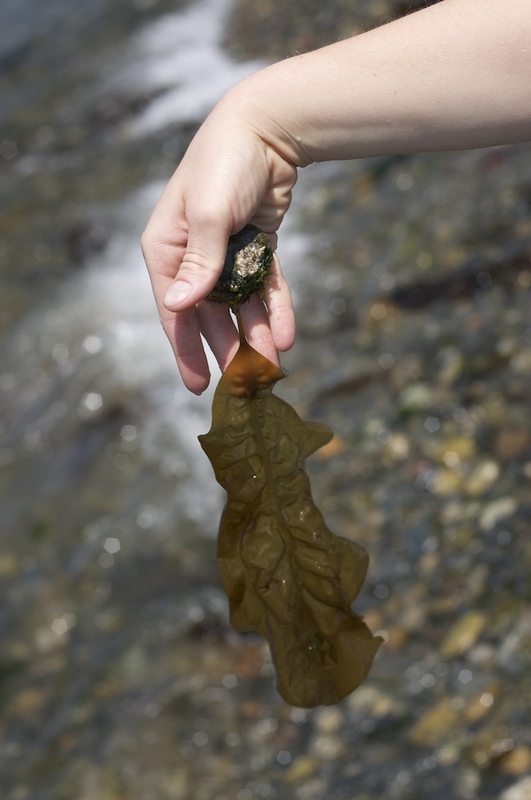 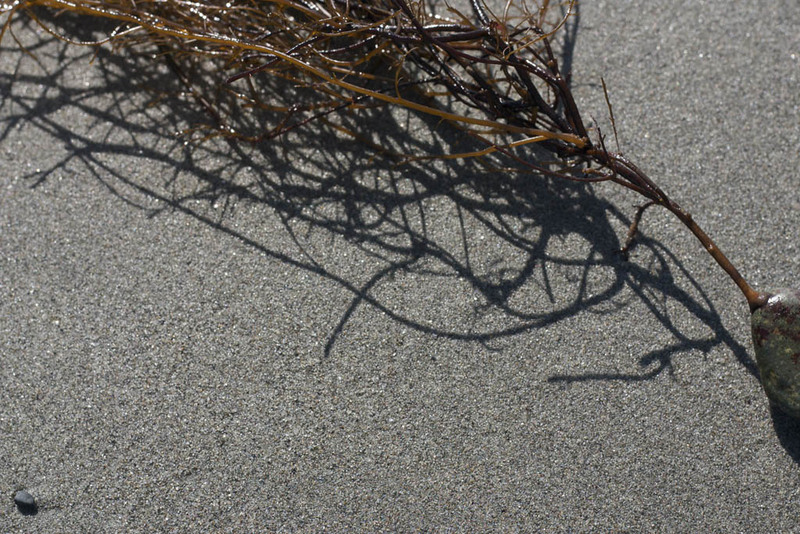 Rockweed has a disc shaped holdfast and half-inch blades with a midrib that branch off two by two. 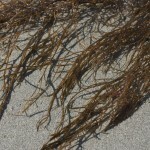 Young branches may appear flat and without the pods on the ends. 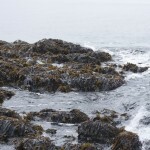 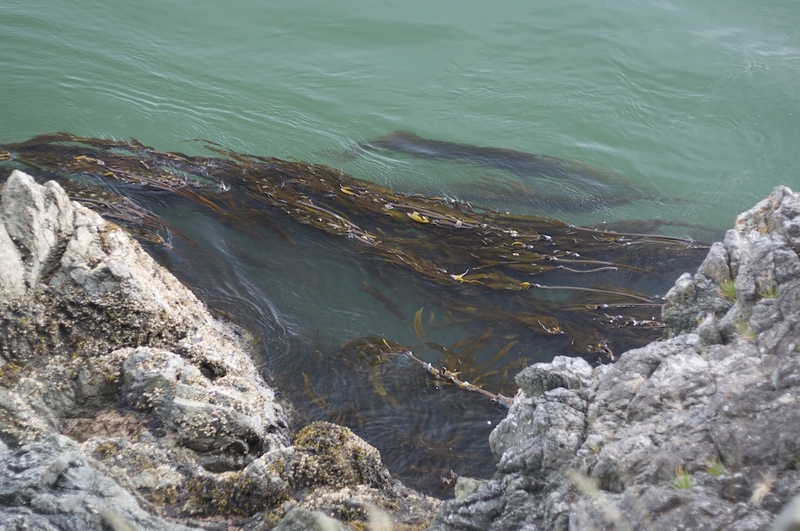 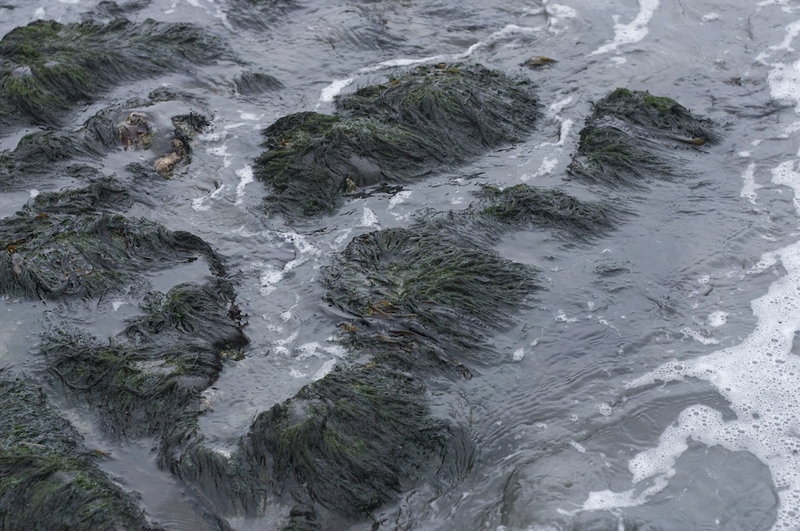 Rockweed prefers rocky terrain. 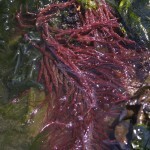 Edibility: Young tips are tasty fresh or blanched. 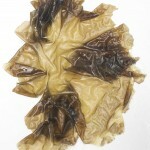 Can also be dried. 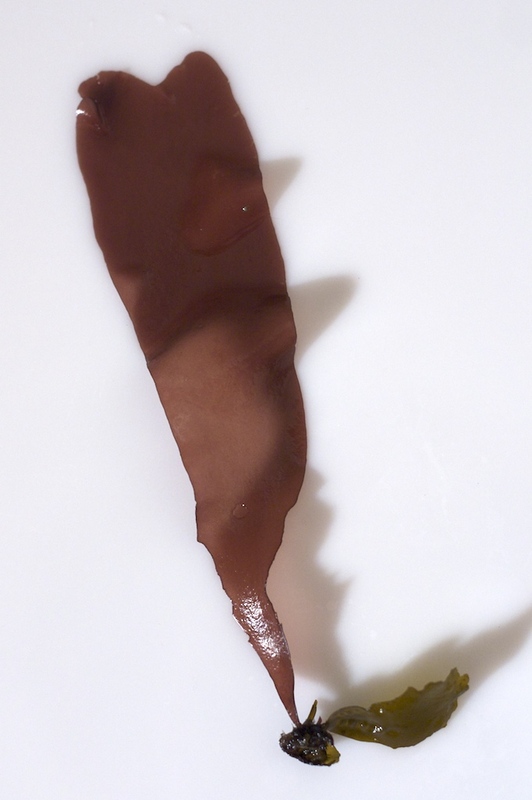 Eat in moderation. 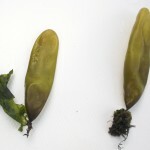 Distinctive characteristics: If you squeeze the mature pods, they will make a popping sound. 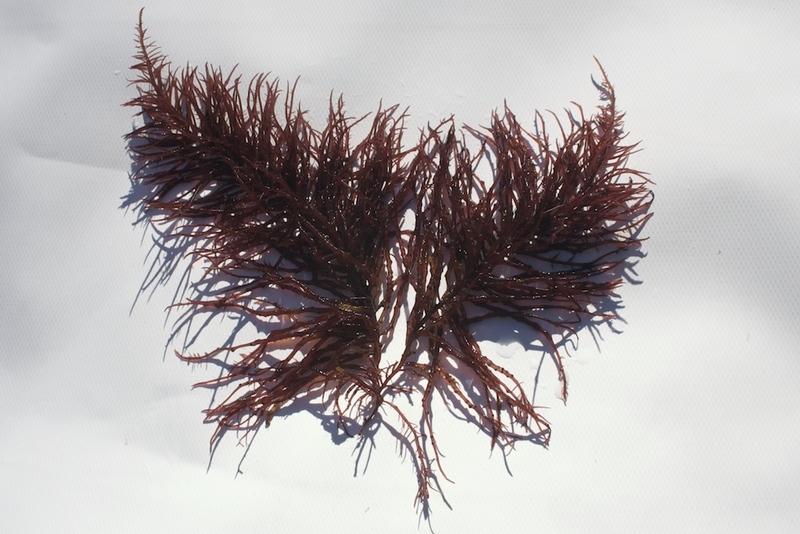 Description: This flamboyant seaweed consists of a thick midrib, fringed with small irregular blades on either side that are interspersed with round floats. 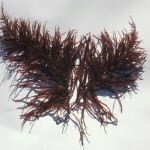 Feather Boa has a large, branching holdfast and a stipe that is round at the holdfast, then branches and broadens to be an inch or two wide. 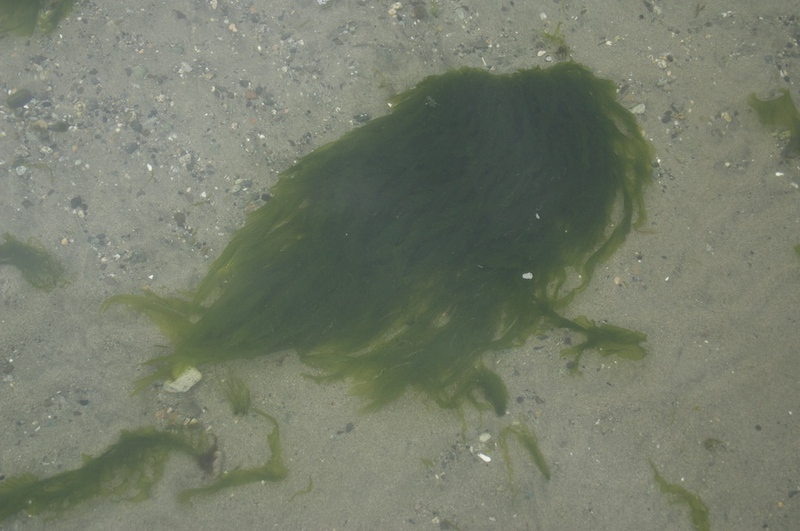 Feather Boa can grow quite long. 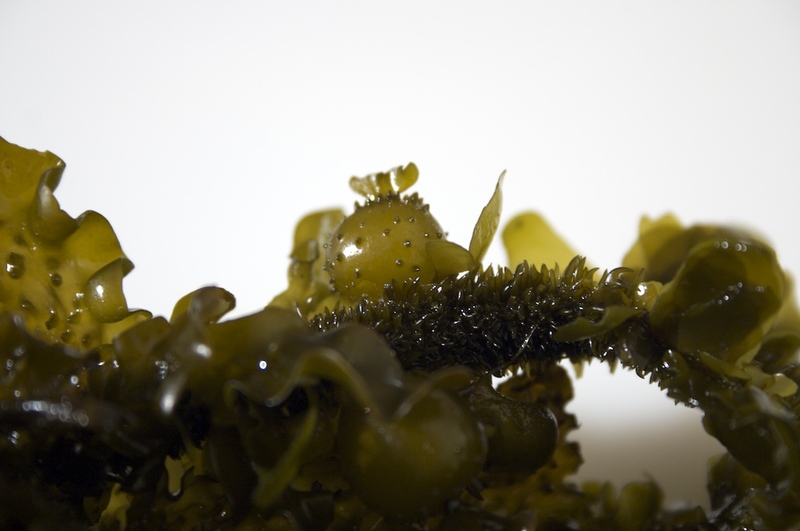 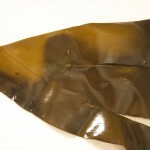 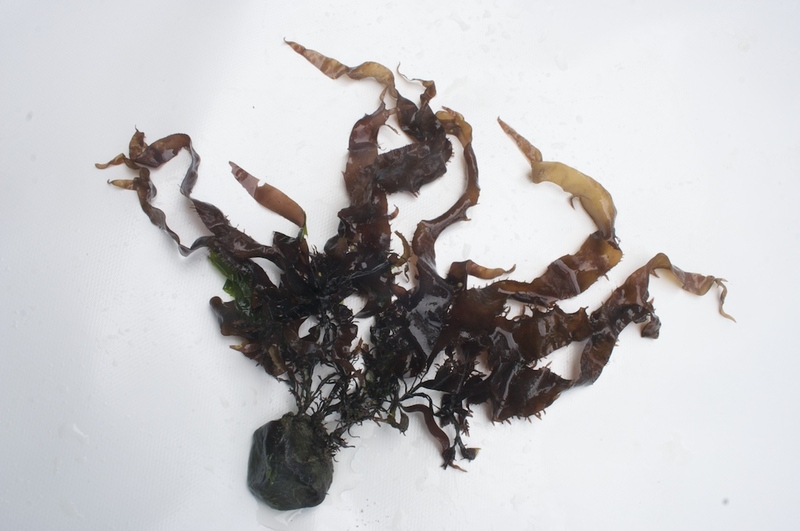 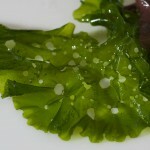 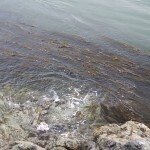 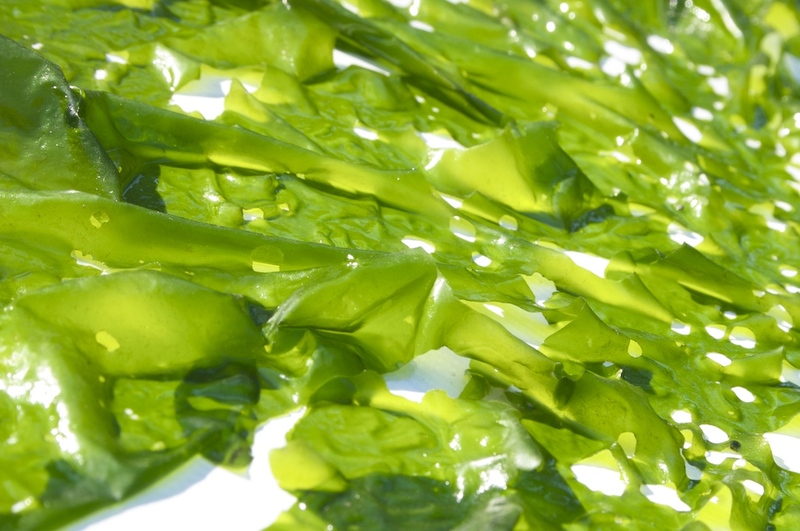 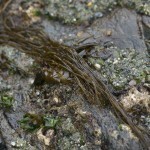 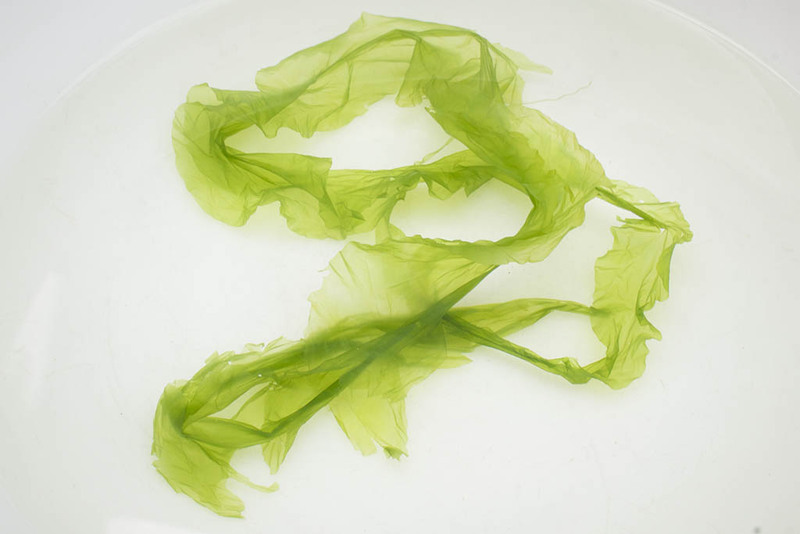 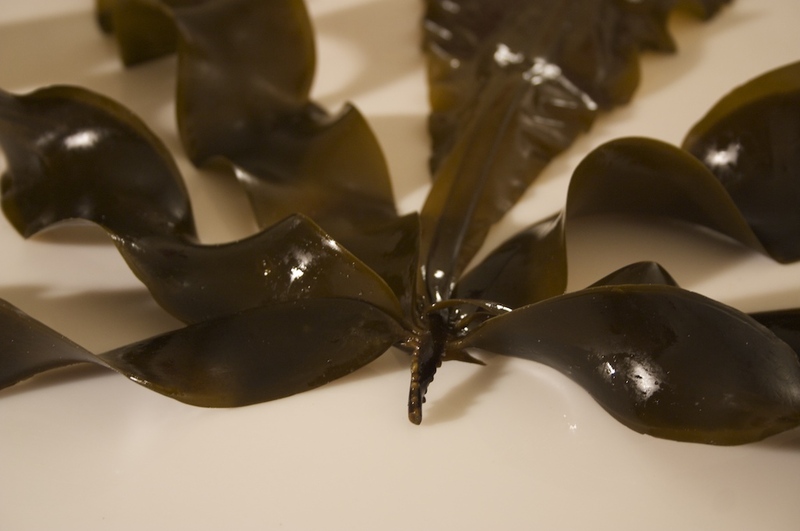 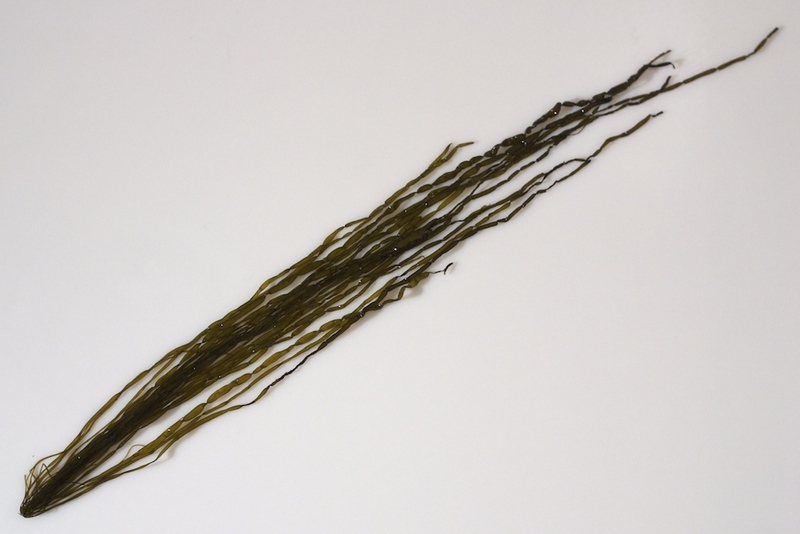 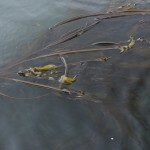 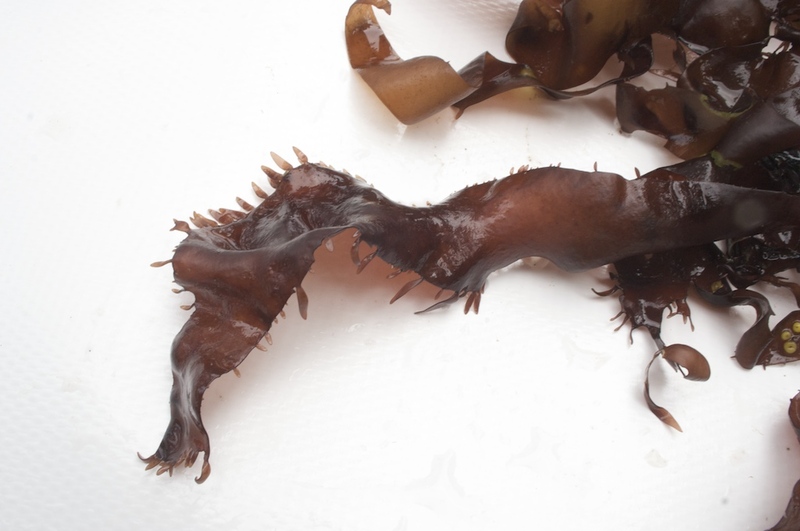 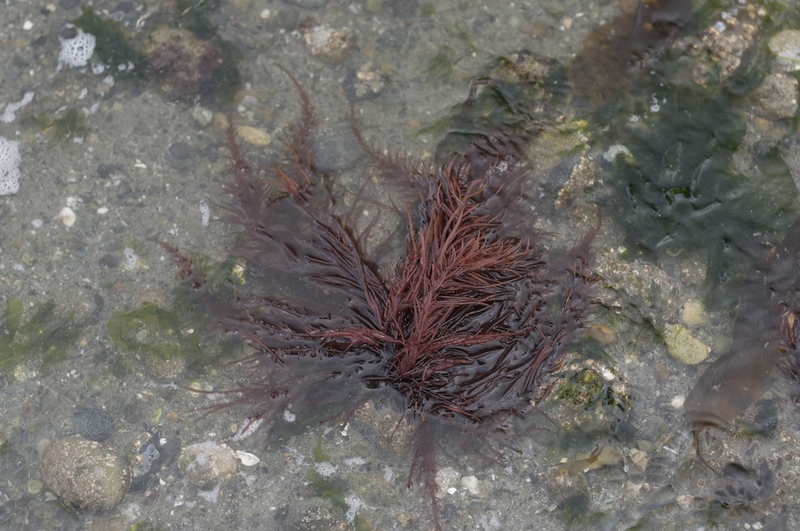 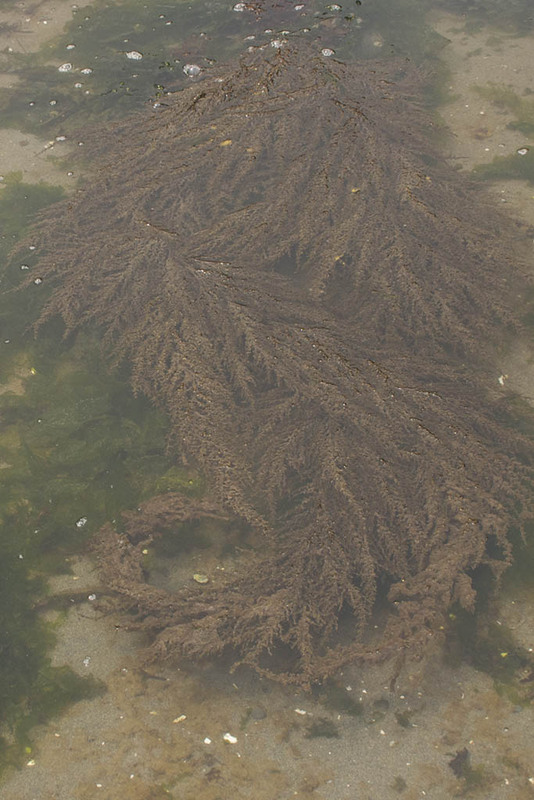 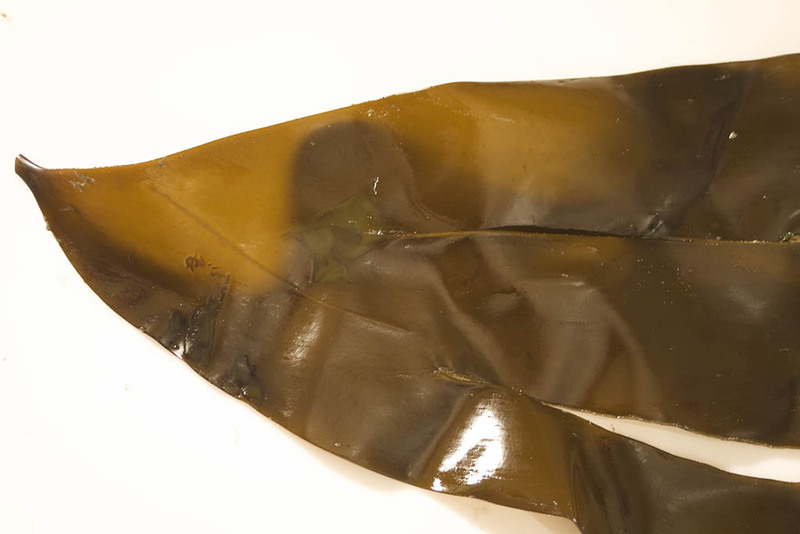 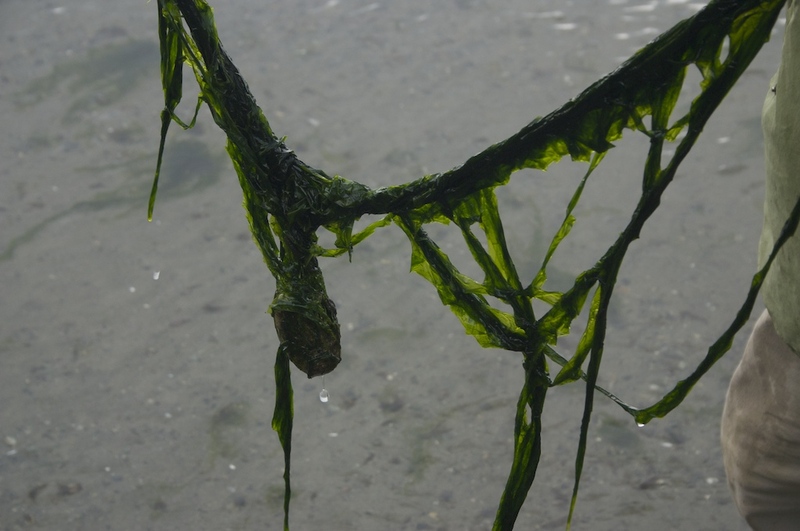 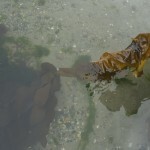 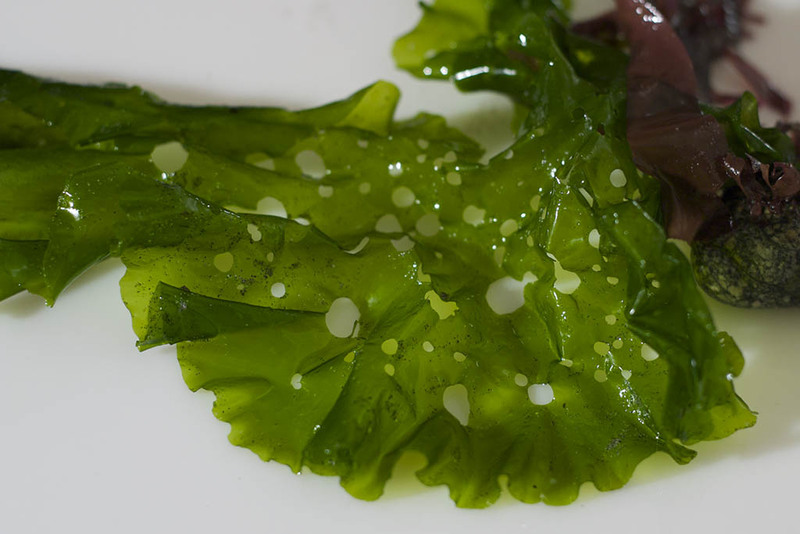 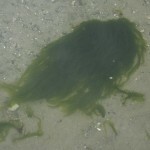 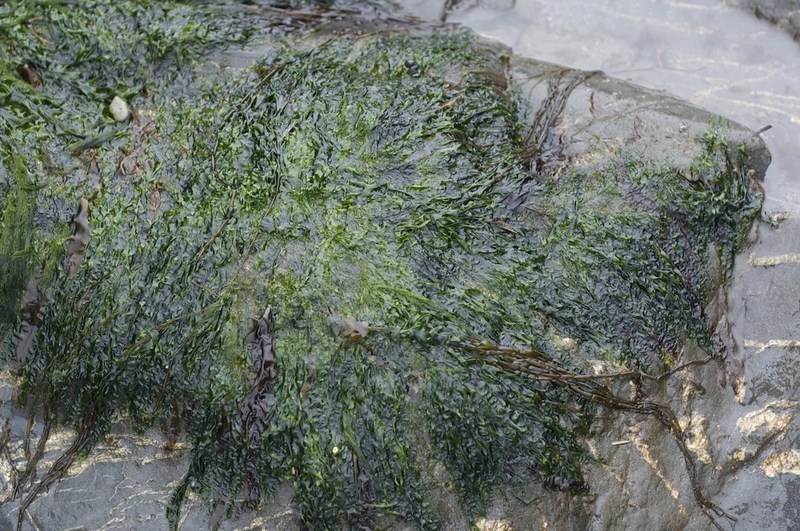 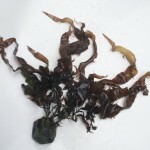 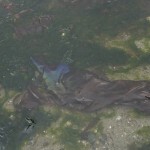 Description: This highly branching seaweed is connected to a small, disc-shaped holdfast. 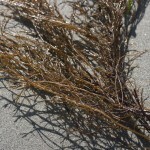 The many thin, round branches give it a busy appearance. 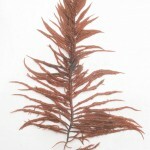 Distinctive characteristics: Releases sulfuric acid when damaged. 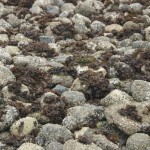 Collection notes: Best to avoid. 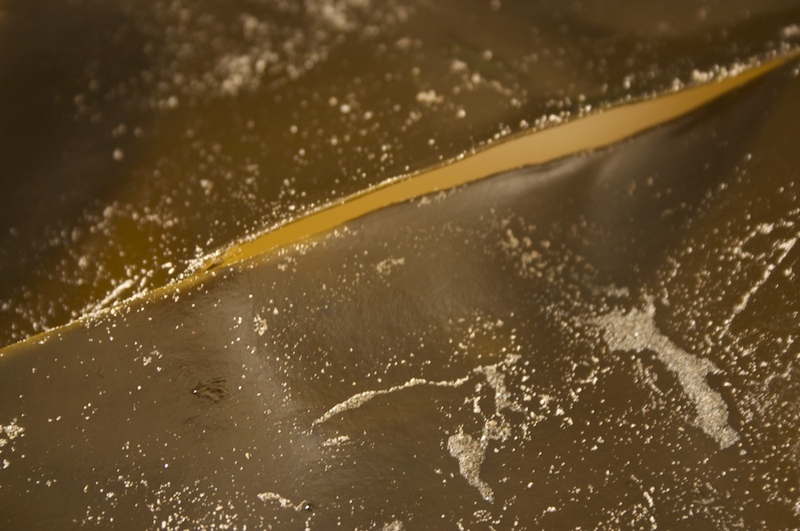 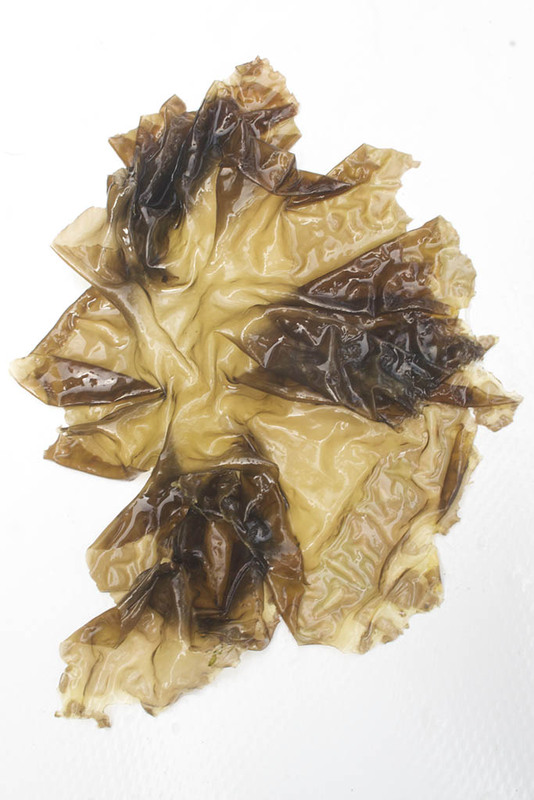 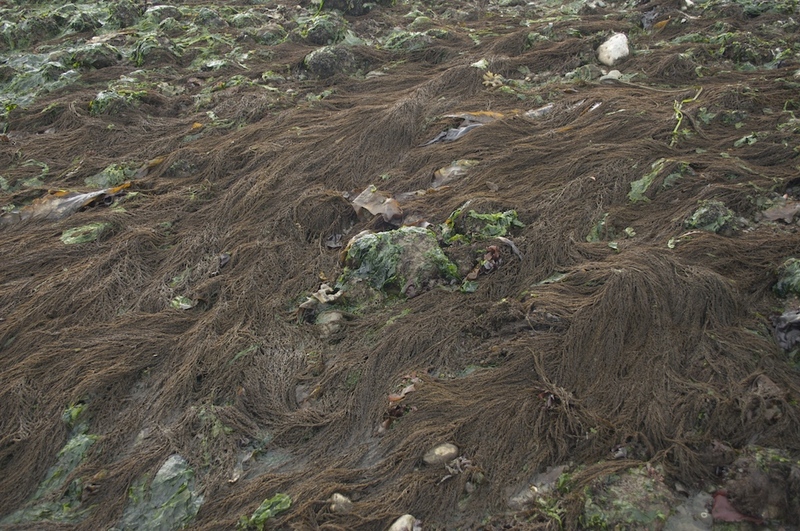 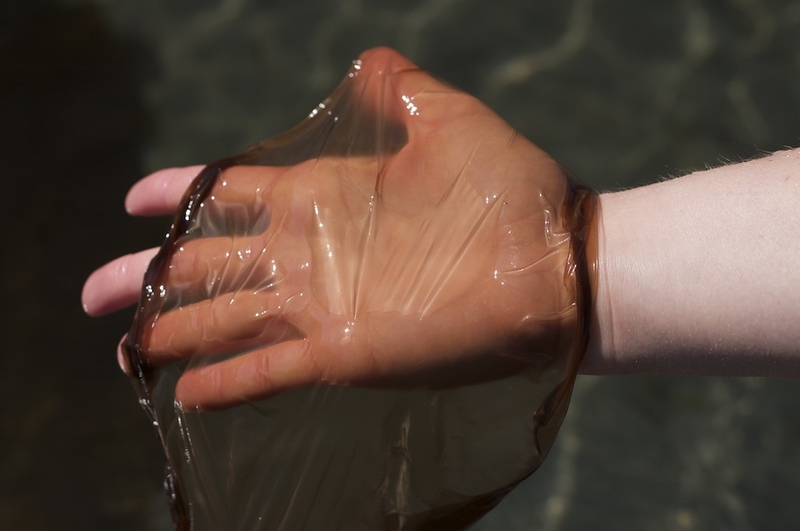 The acid released by this seaweed will destroy other seaweeds collected if left in the same container. 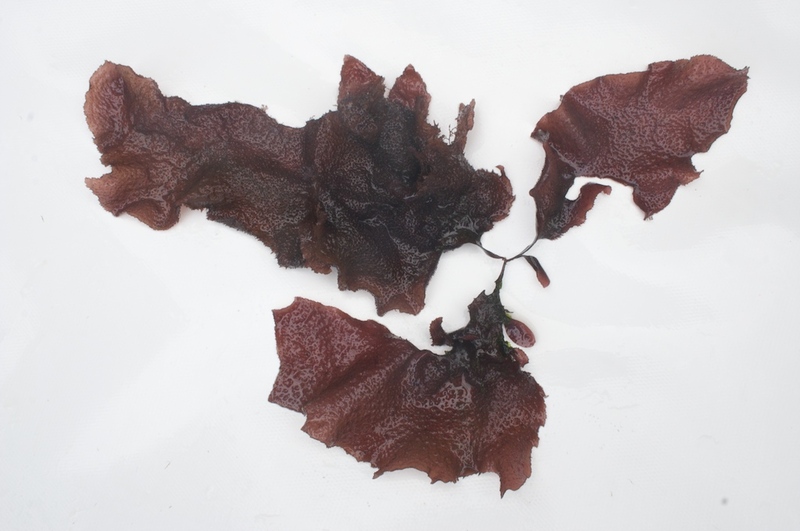 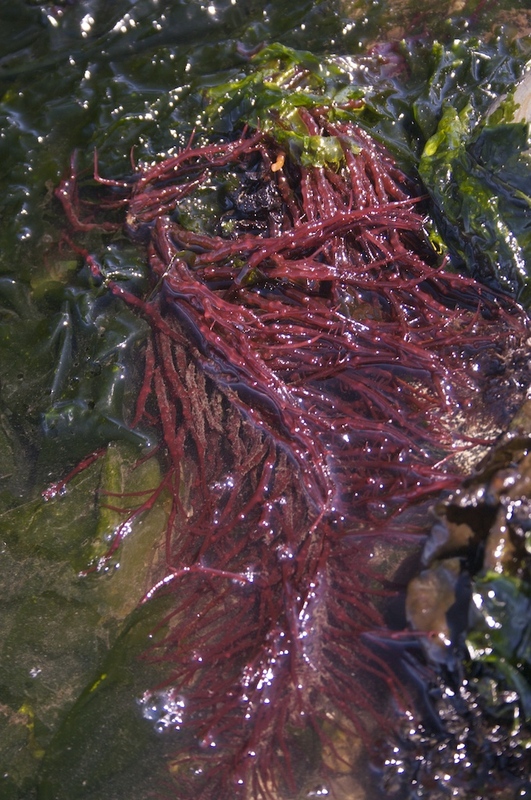 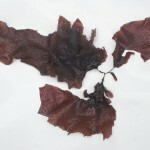 Description: This bright red seaweed can look tree-shaped, with longer branches at the bottom tapering to shorter branches at the top, around a central axis. 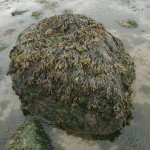 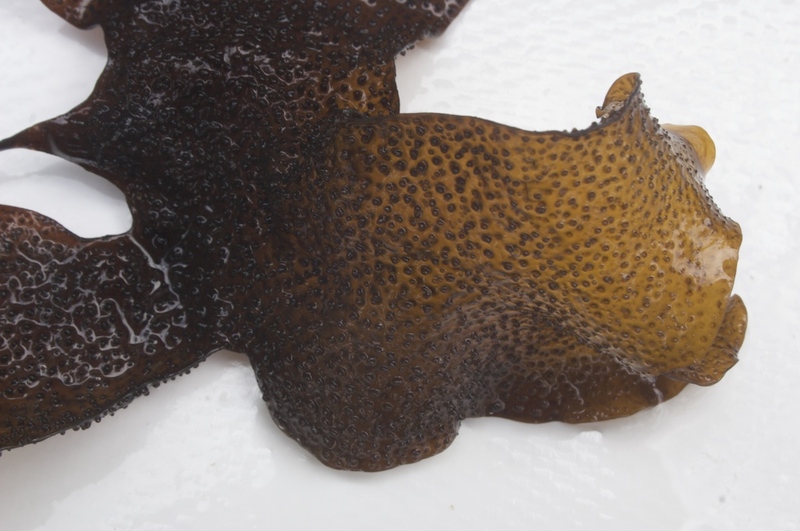 It has a disc-shaped holdfast and a warty texture.